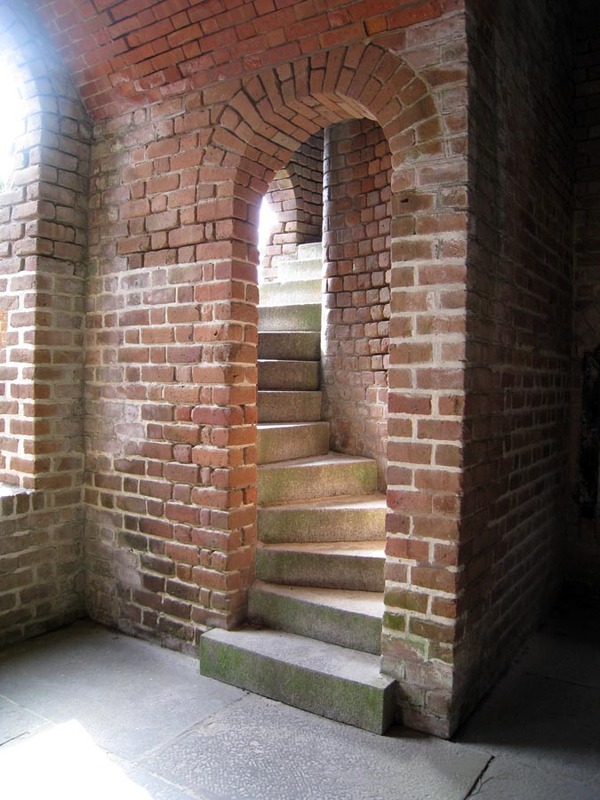 Toward the end of last year Melanie and I visited Fort Clinch. 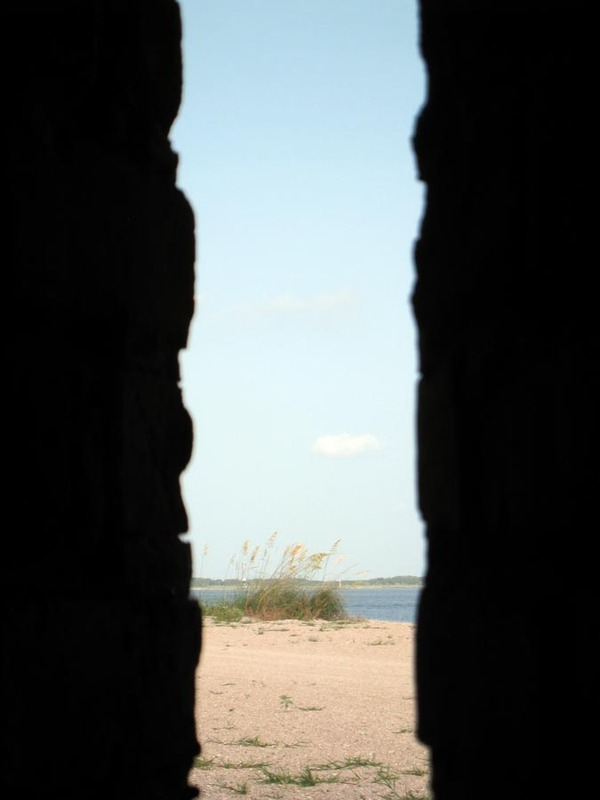 I had heard the name in every Folio Weekly Ad (“From Fort Clinch to the Matanzas Bay”) and was curious to see what it was all about. One Saturday morning we realized we were going to be right by the place when we went to watch an ocean-based triathlon so we took the opportunity to check it out. 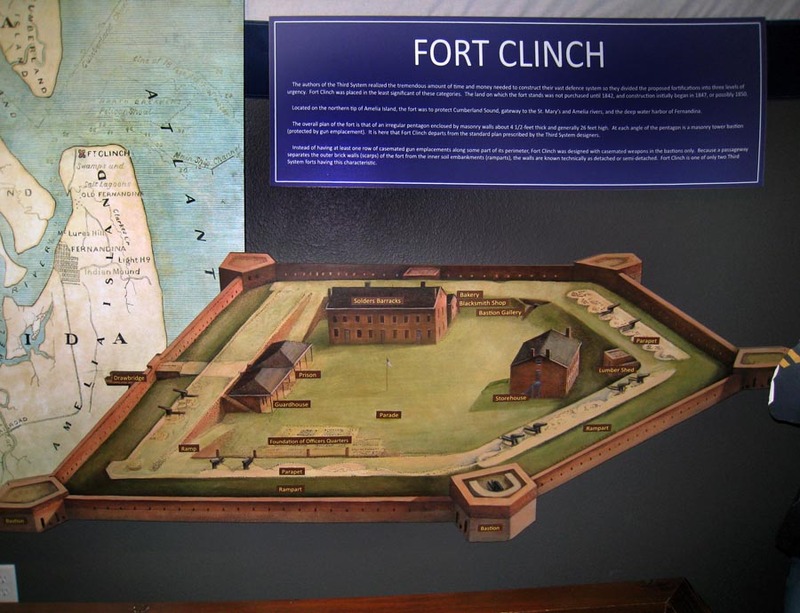 Located at the absolute northeasternmost corner of Florida, Fort Clinch was built to protect the mouth of the St. Mary’s River and the port of Fernandina, FL. It is one of the best preserved examples of Third System Fortifications in existence. 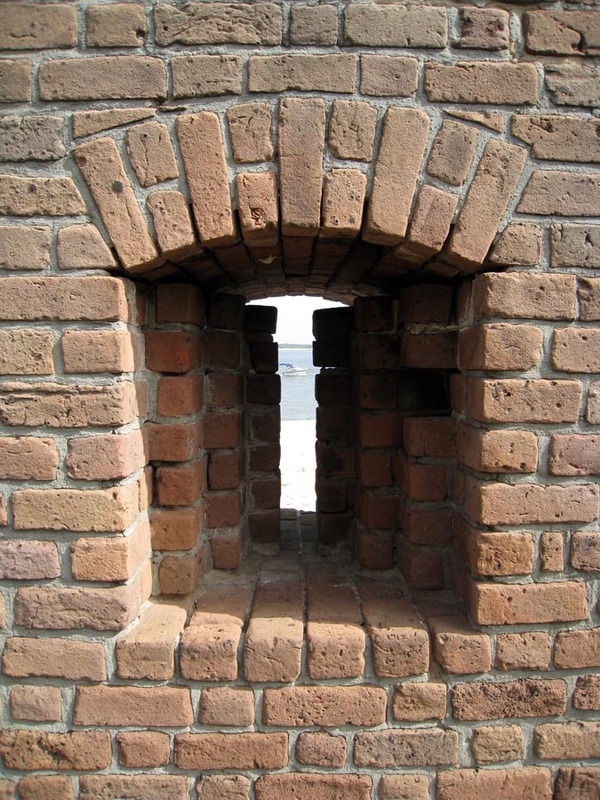 That means it has a two-walled construction with an outer brick wall and an inner earth wall. 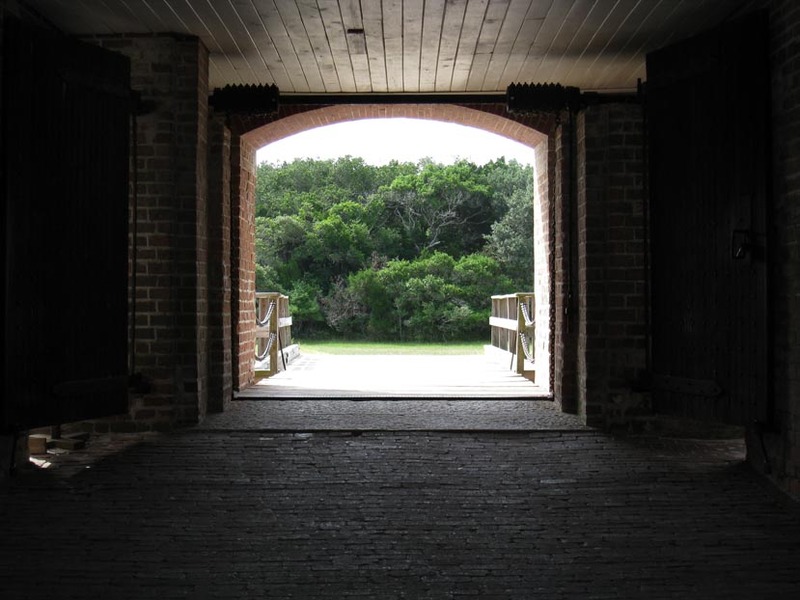 Named in honor of General Duncan Lamont Clinch, work began on Fort Clinch in 1847. Construction progressed slowly and by 1860 only two of the bastions and one third of the brick wall was completed. 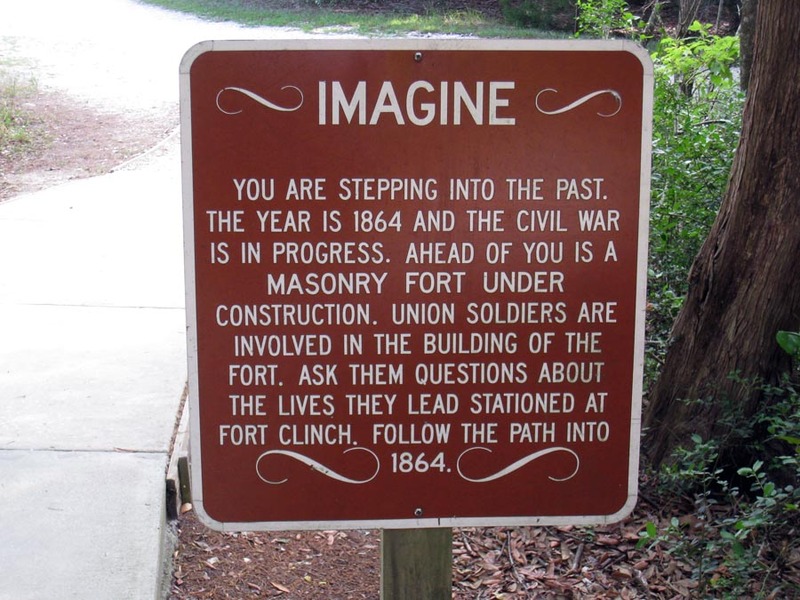 Improving weapons technology began to make brick fortifications like this one obsolete, but construction continued until 1867 when the fort was nearly finished. 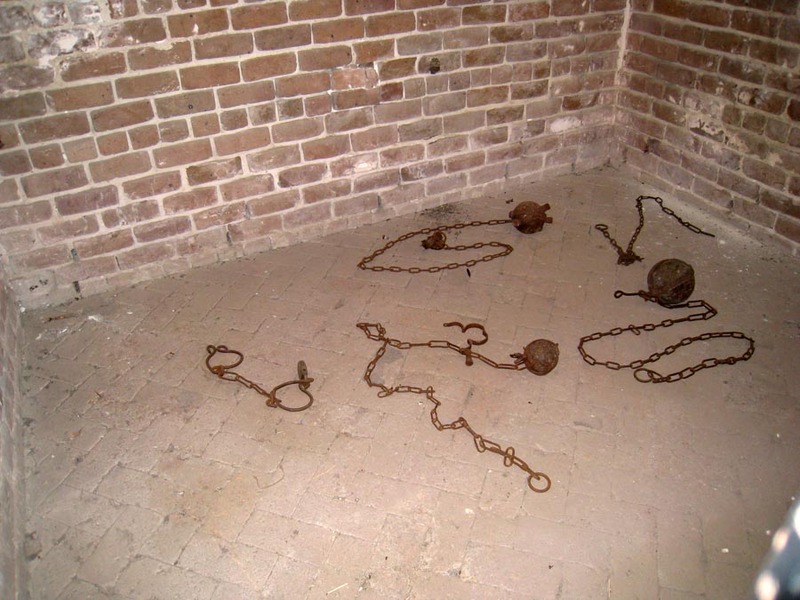 Fort Clinch was used off and on by the military until 1945 even though the State of Florida bought it and its surrounding property in 1935 eventually turning the site into a state park. It was a really hot mid morning when we arrived. The first stop was the air conditioned gift shop where we purchased tickets. 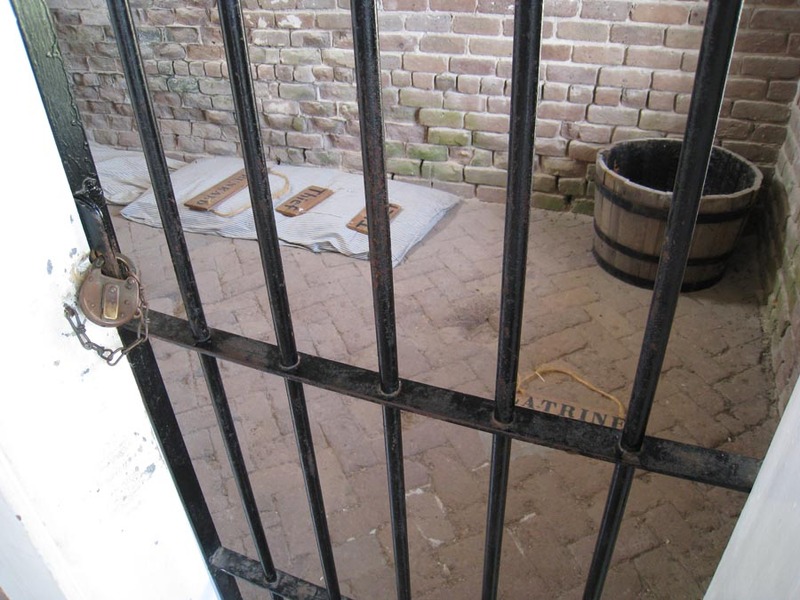 They sell some snacks, drinks and Fort Clinch doodads just like you’d expect. From there we walked a moderately lengthy path to the sallie port (entrance/exit tunnel) complete with drawbridge. Once inside we met a couple of period actors that explained what life was like for men and women (cooks and laundry) working at the fort during the Civil War. Walking around to the various buildings we could look inside some and actually enter others. 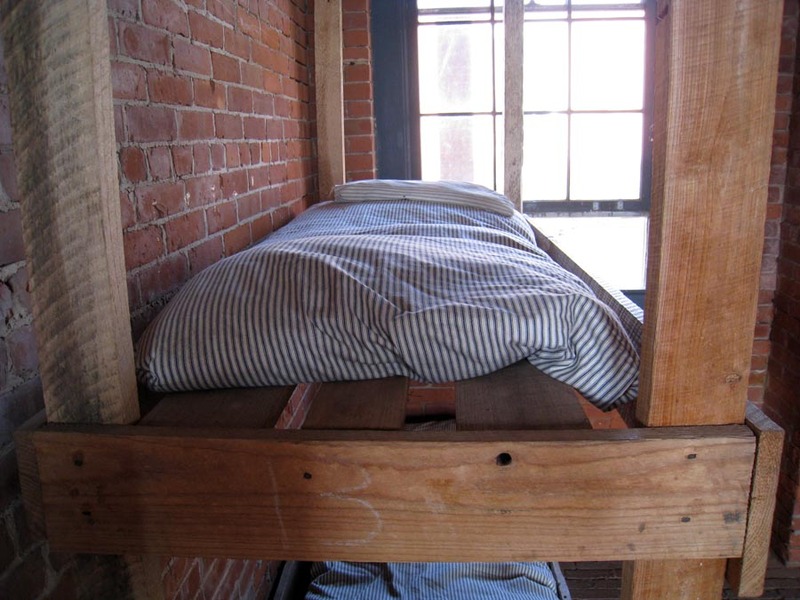 Each was outfitted with its Civil War era trappings. The view from on top of the wall showed exactly why this was such a great spot for a defensive fortification. We couldn’t have spent more than an hour or two here and I don’t remember it being very expensive, although you pay to get into the park and then again to visit the fort. 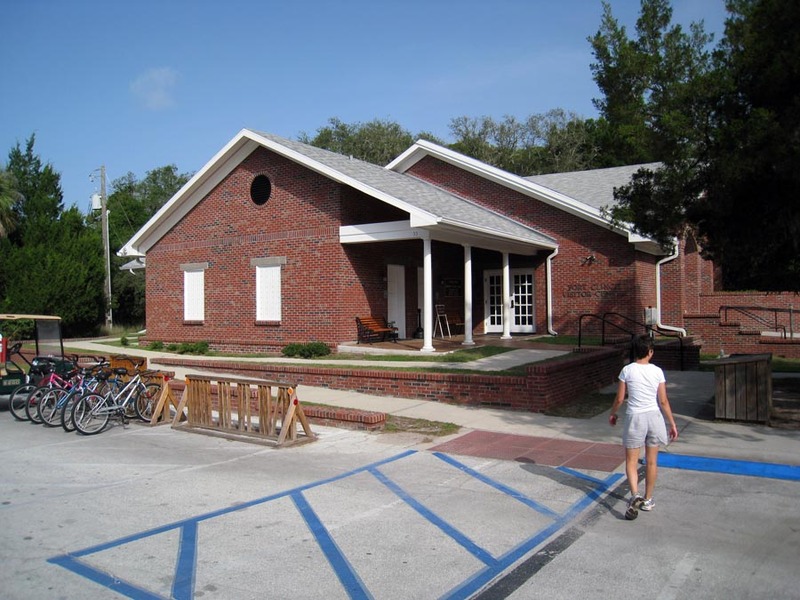 Overall, Melanie and I enjoyed ourselves and if you live in the Jacksonville area, I’d recommend a visit. 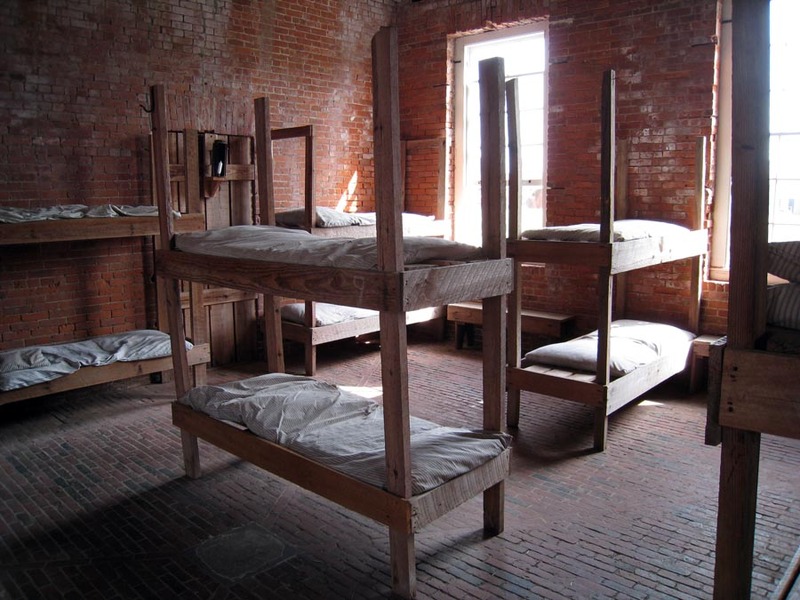 The fort is well maintained and every place we went was quiet and clean. Busy Campground. 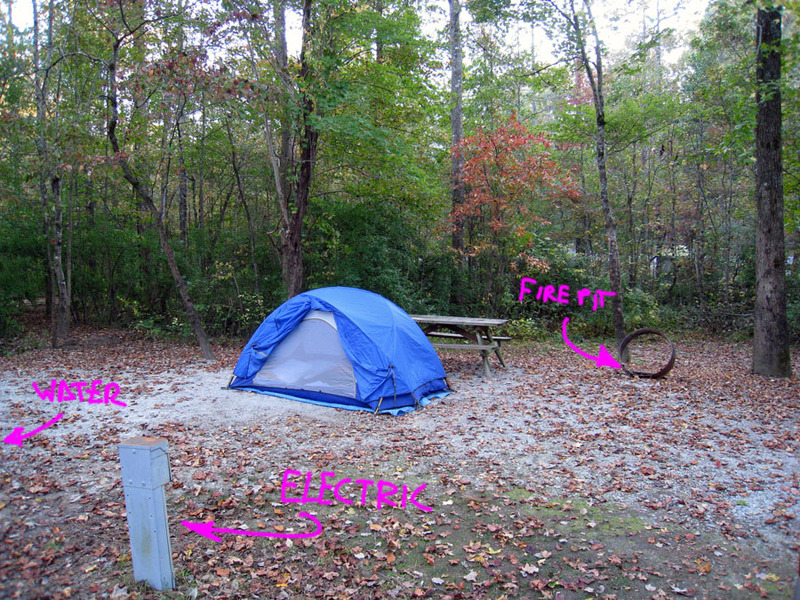 Typical Campsite. Ok for RV's. Crappy for Tents. No Shade! 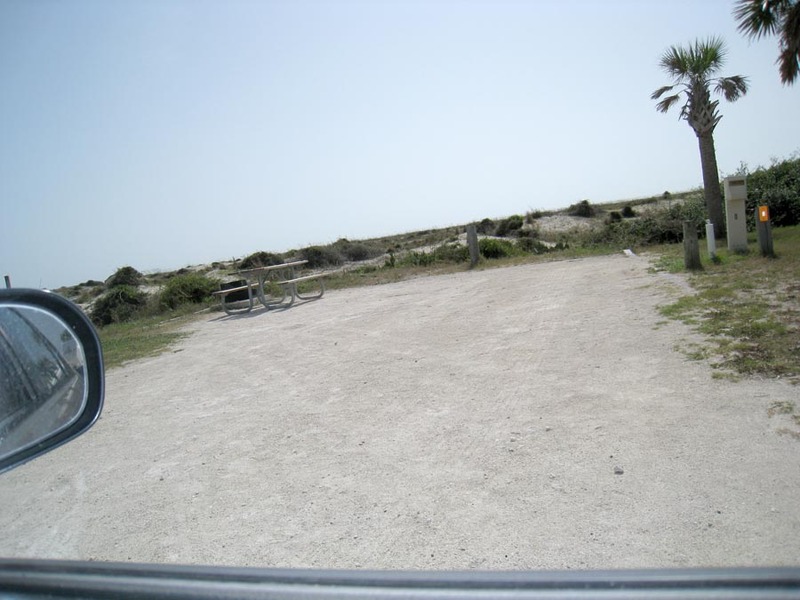 The remainder of the surrounding property has some very nice looking (and nearly empty) beaches, some hiking trails and a pier to fish from. We drove over to the RV camping area which had a surprising number of occupants for a non-holiday time of year. As you can see from the picture, it would be a fairly miserable place for tent camping though. There was absolutely no shade to be found at this campground. 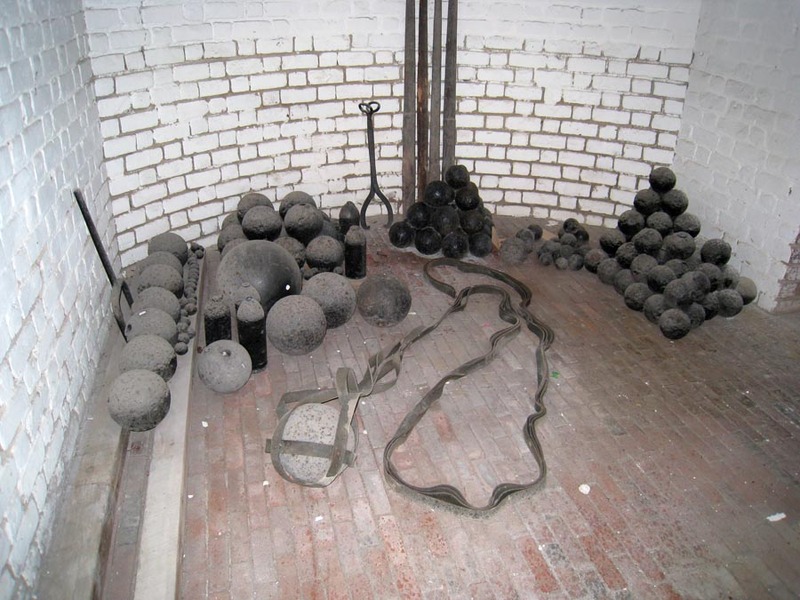 Cannonball Storage Directly Below Cannons. 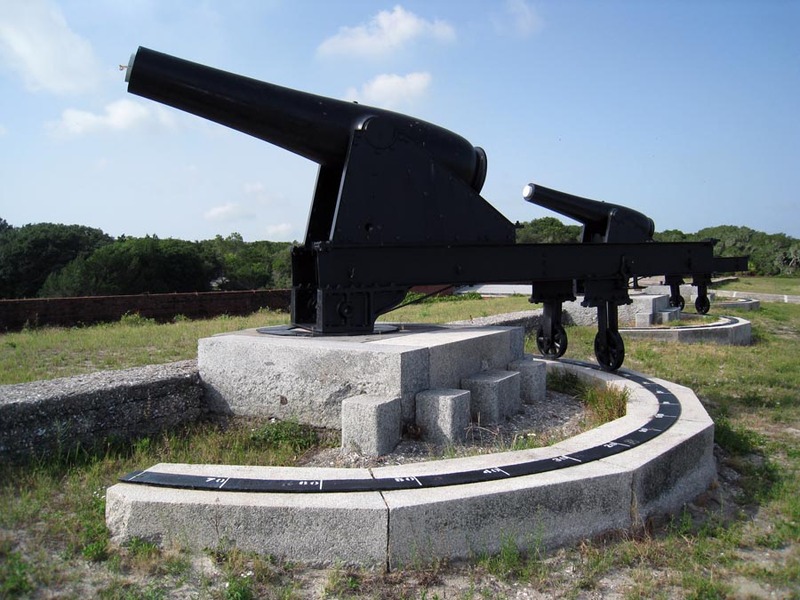 Ordinance Hauled to Cannons via Long Strap. Busy Campground. 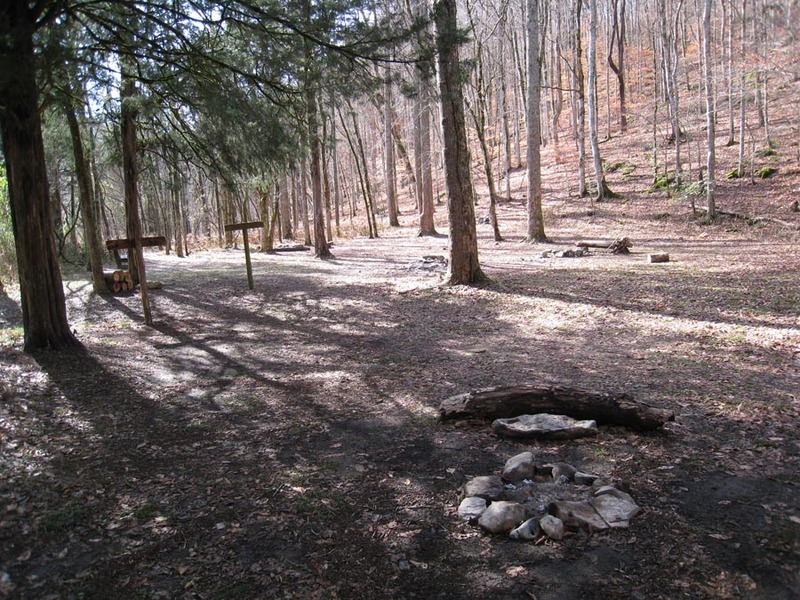 Typical Campsite. Ok for RV’s. Crappy for Tents. No Shade! 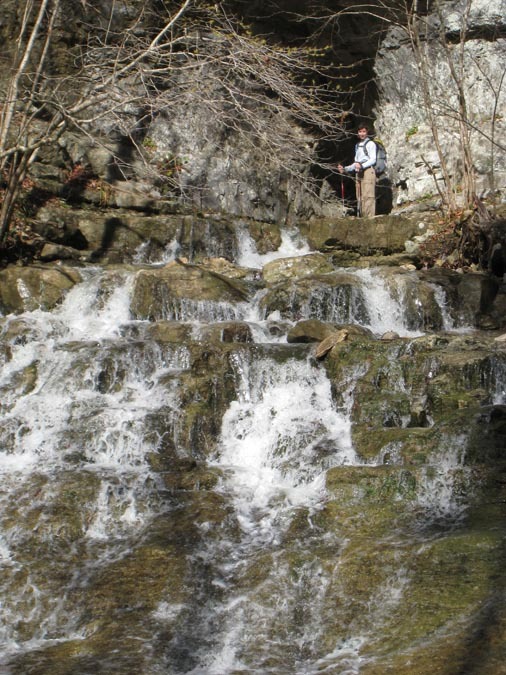 Last year when we hiked to Virgin Falls we decided it was just about the perfect time for hiking that part of the country – no bugs, no heat, no humidity, not too cold and good water flow in streams and waterfalls. This year we decided to find another place to hike in the area at about the same time. 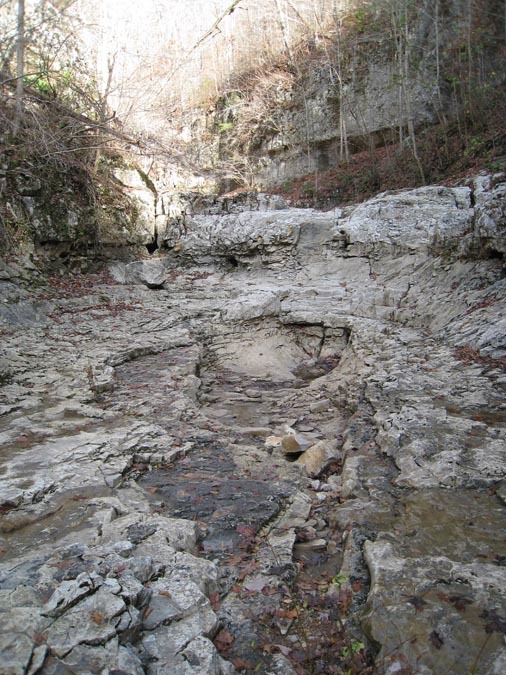 The choice was the Walls of Jericho near Scottsboro, Alabama. 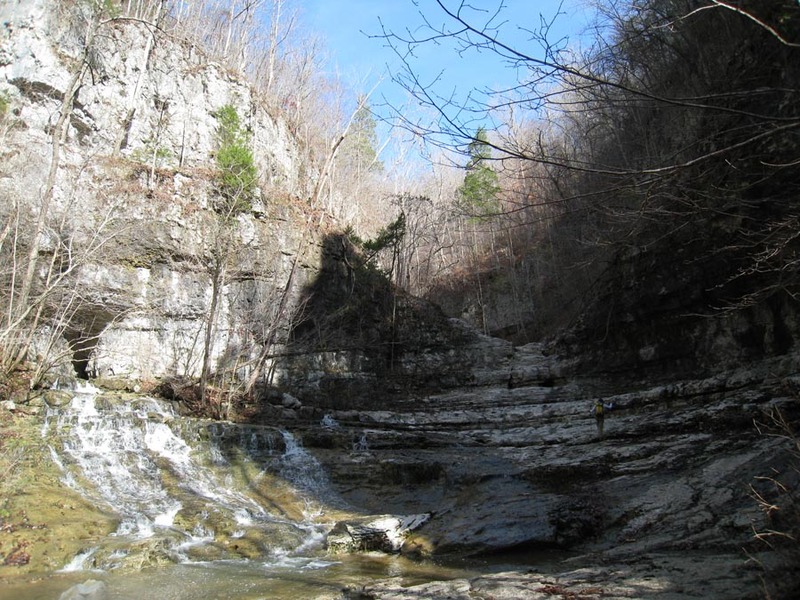 The Walls of Jericho is a natural rock amphitheater where water sprays and cascades out of multiple holes and cracks in the surrounding 200’ tall gorge walls. Apparently the water flow varies by season and the appearance of the place drastically changes accordingly. 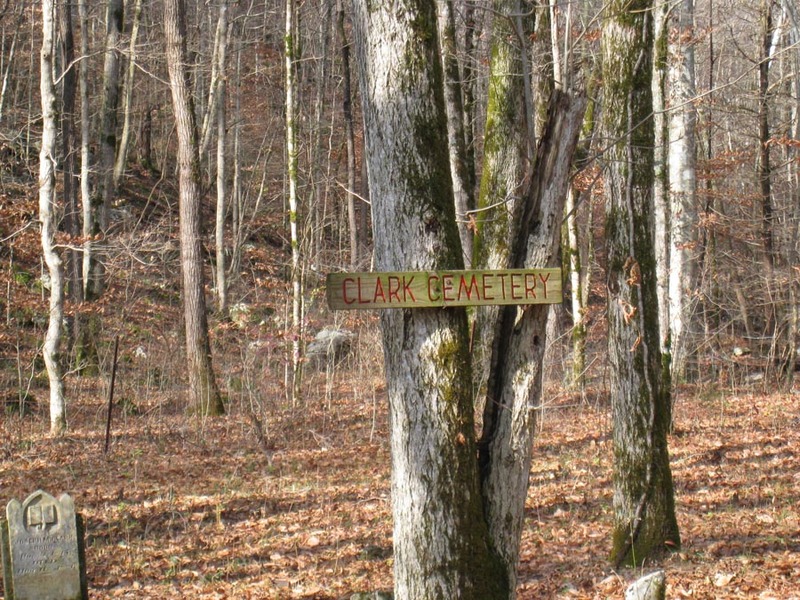 It was a place I’d heard about as a kid but was off limits to the public. 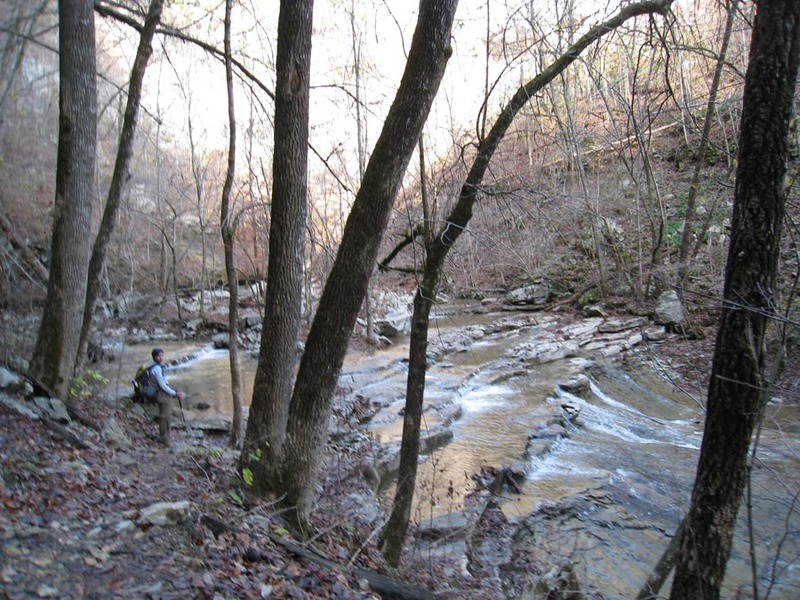 In 2004, Alabama’s Forever Wild Land Trust purchased some of the large tract of land that spans Tennessee and Alabama and contains this scenic wonder, bringing it back into public use. Walls of Jericho Looking In To The Gorge. Walls of Jericho From The Inside Looking Out. 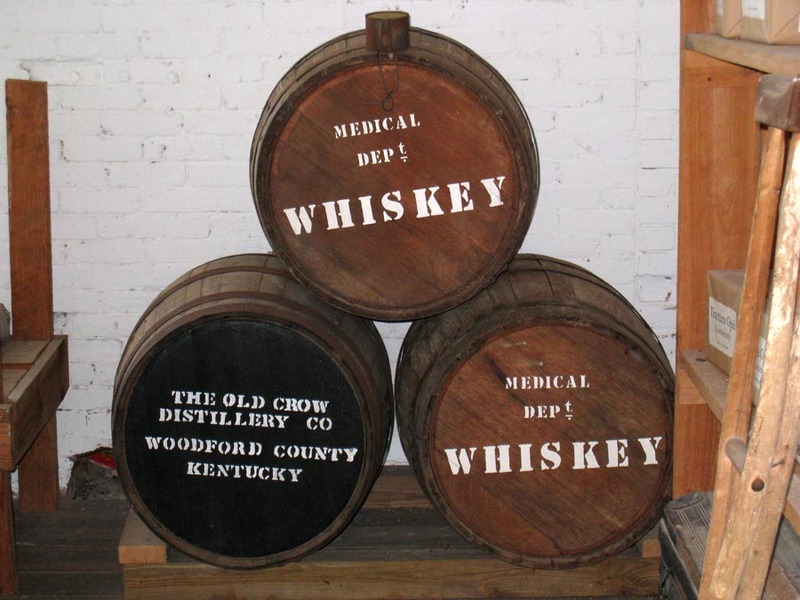 You can get to the Walls from Tennessee or Alabama. 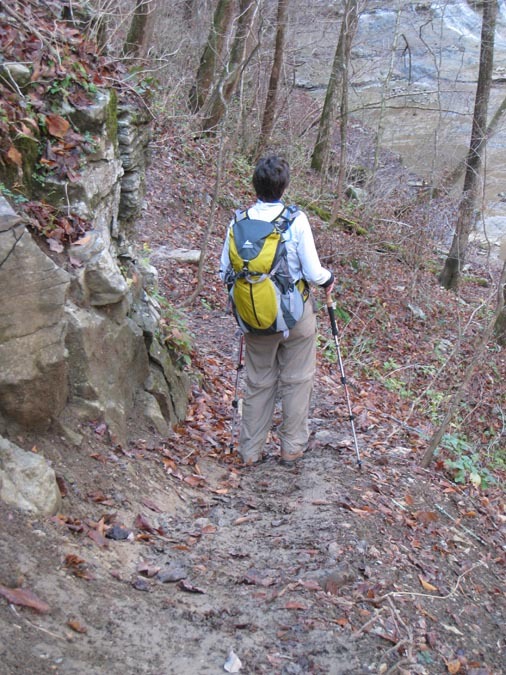 This trip details an out and back trip on the Alabama trail. 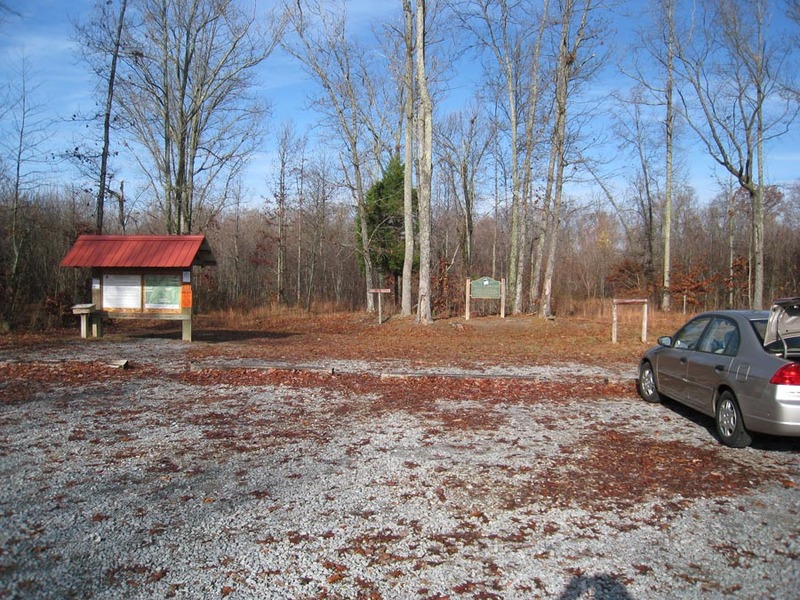 If you had two cars, it would probably be more fun to drop off a car at the Alabama trailhead and then drive up to the Tennessee trailhead and start from there. Foggy Morning. Could Rain On Us. Please Don't. It Would Make Melanie Crabby. The description of the hike I’ve read other places is pretty accurate. 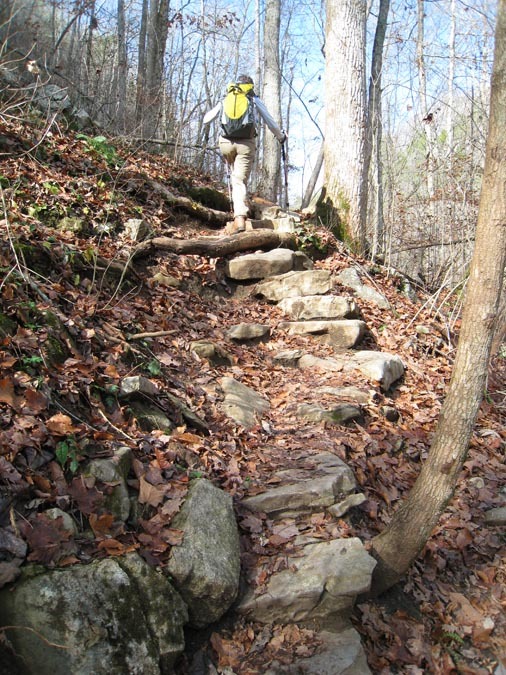 It has earned its strenuous rating because of its length, incline and trail conditions. 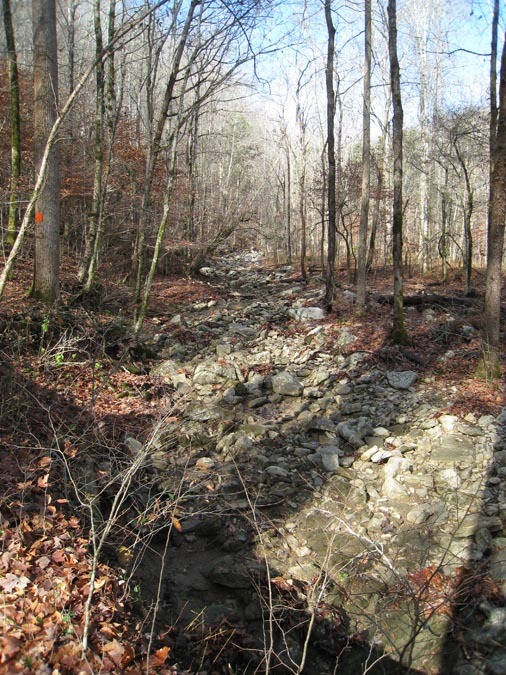 There is an elevation change of at least 1000 feet over the course of the Alabama trail. 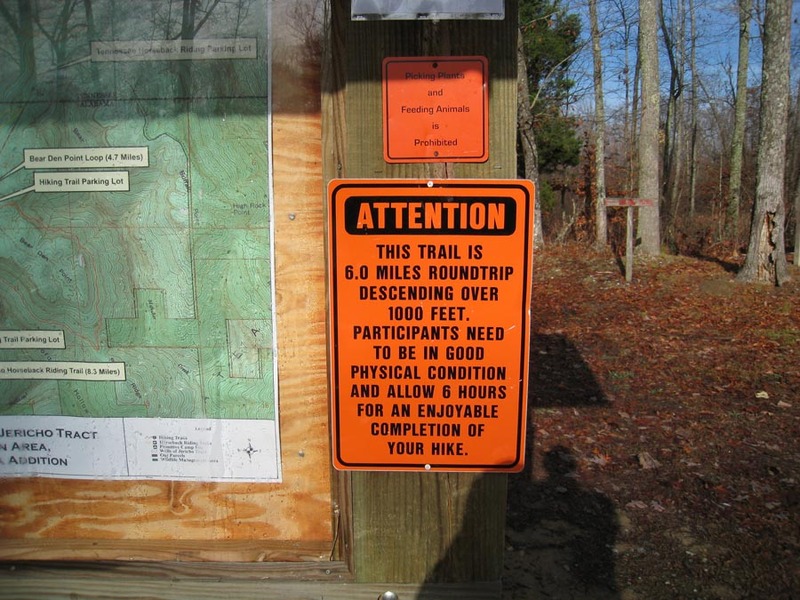 If you are in pretty good shape, expect it to take you four hours to hike the six miles (roundtrip). 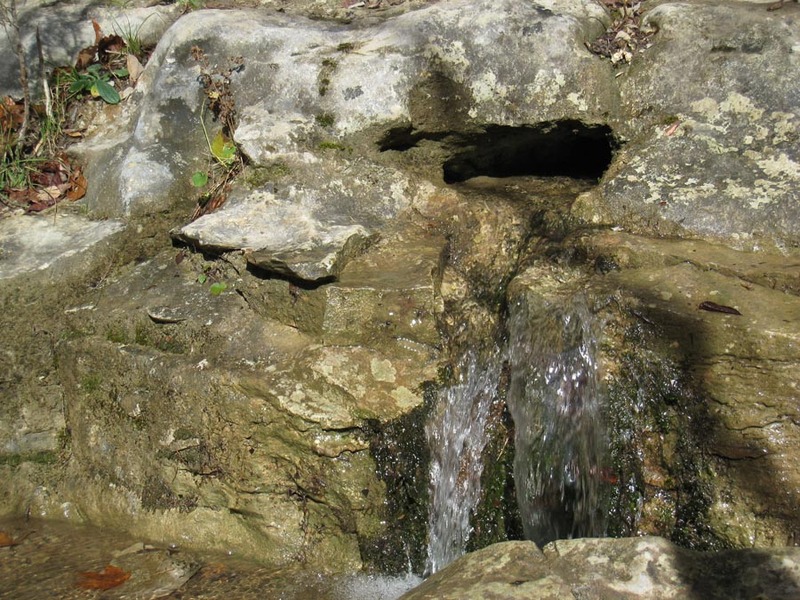 It isn’t as tough as Virgin Falls, but it will probably get you breathing hard from time to time. Guides recommend allowing two hours for playing around at the Walls. 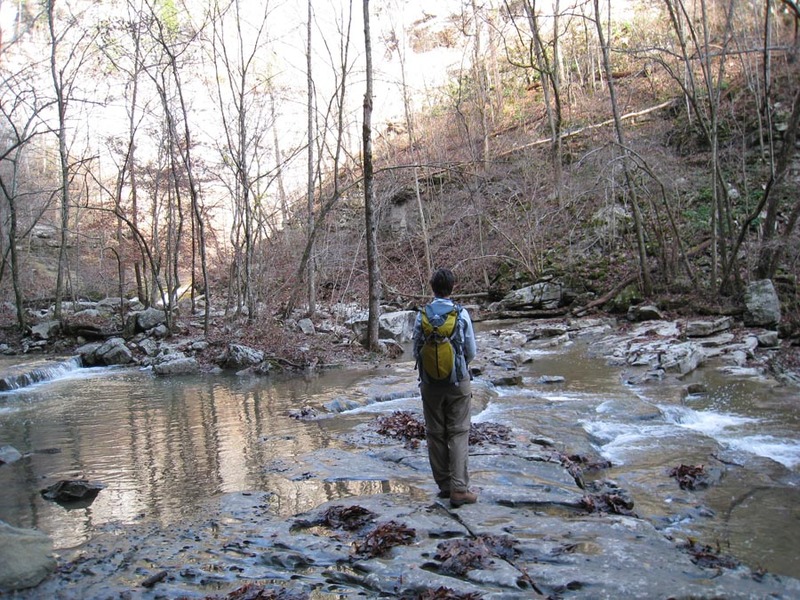 There is a lot of rock scrambling and some cave exploring you could do but if you are just planning to hike in, take a look and eat lunch, you won’t spend nearly this much time there. Our total hiking time including a short lunch was just over four hours. We had been warned that it would be muddy and slippery even if it hadn’t been raining recently. This proved to be true for us and it hadn’t even rained much lately. For this reason I highly recommend leaving a change of clothes and footwear at the car just in case you take a tumble or a slide somewhere on the trail. Trekking poles are a huge plus. 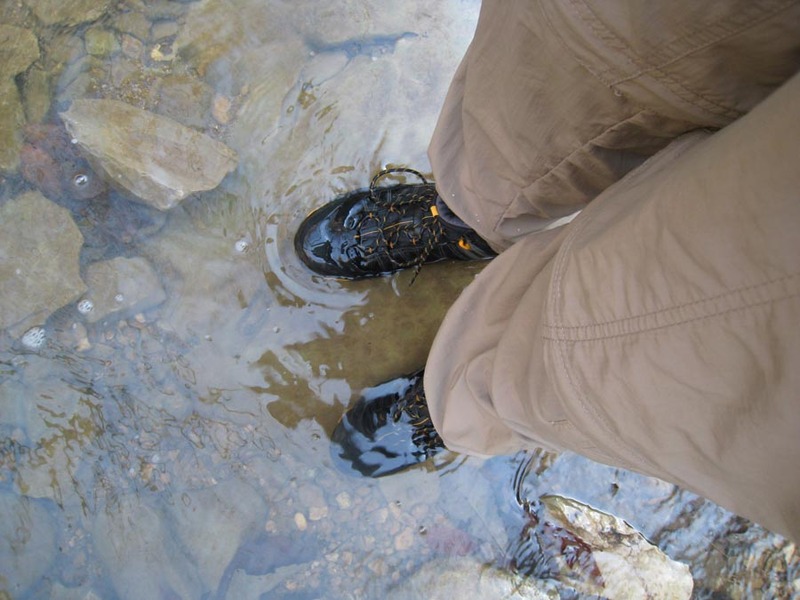 Grippy waterproof boots are great too. Does this mean you must have this equipment? No way. There were folks strolling along in their tennis shoes that did ok too. It was definitely more enjoyable and safer for us with this equipment though. 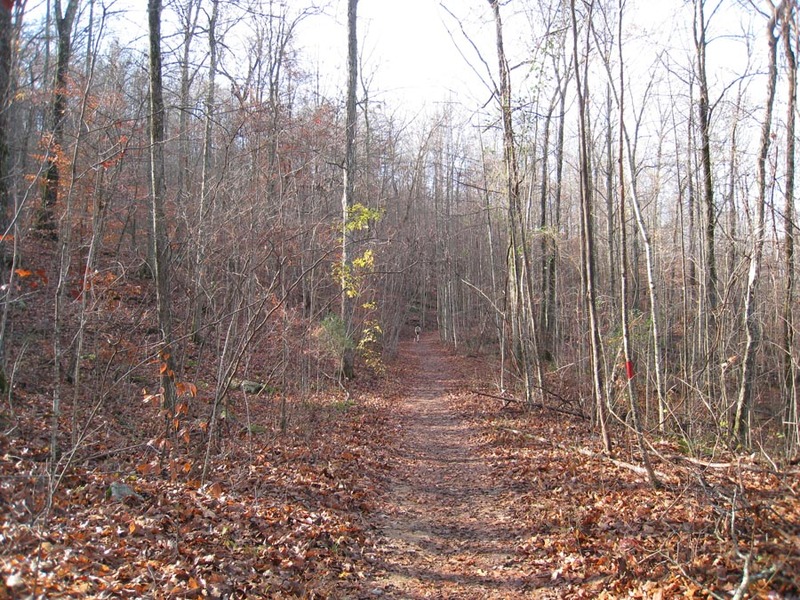 Also, it would be smart to hike this trail with a partner. We didn’t see anyone going it alone when we were there. PRO TIP: If you are traveling north on Highway 79 to get here, be aware that you will come to the horseback riding parking lot first. 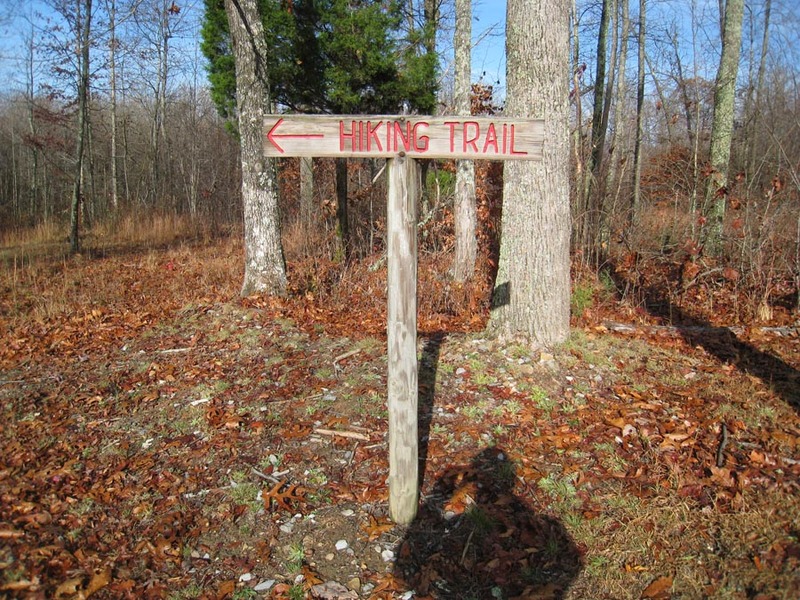 We just assumed that the nice sign with the horse on it meant that it accommodated both hikers and horseback riders. After just a few minutes on the trail, we realized that something was wrong, looked at our map again and realized what we had done. 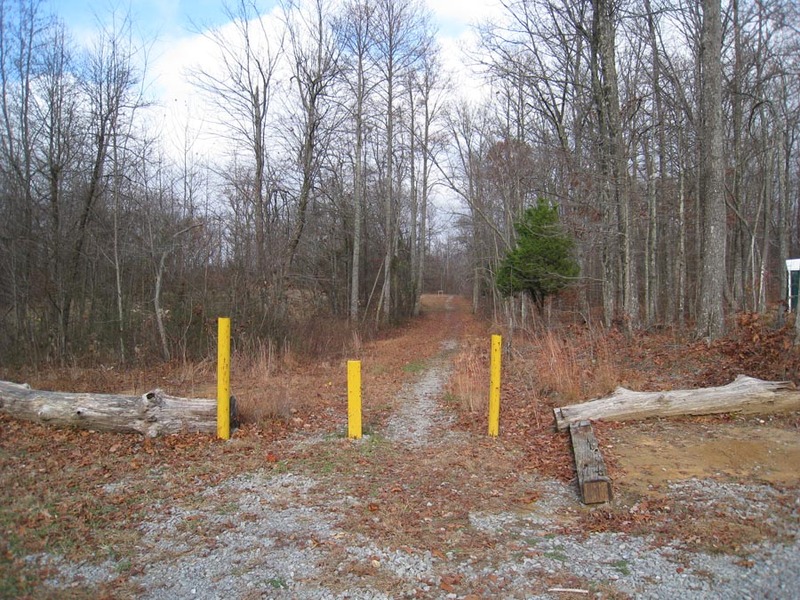 Trailhead For Horseback Riding (But We Didn't Know It Yet). Yellow Blazes. This Doesn't Seem Right. Pyewp! 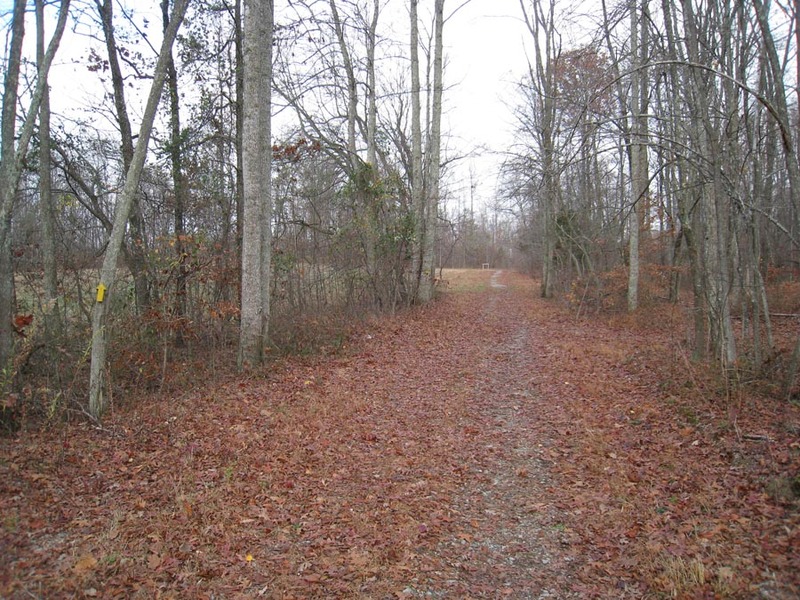 It's The Horseback Riding Trail. Now I'm The Crabby Baby. Back in the car, we continued up Highway 79 for just a short distance and we found the correct parking area. It had a handy sign too. 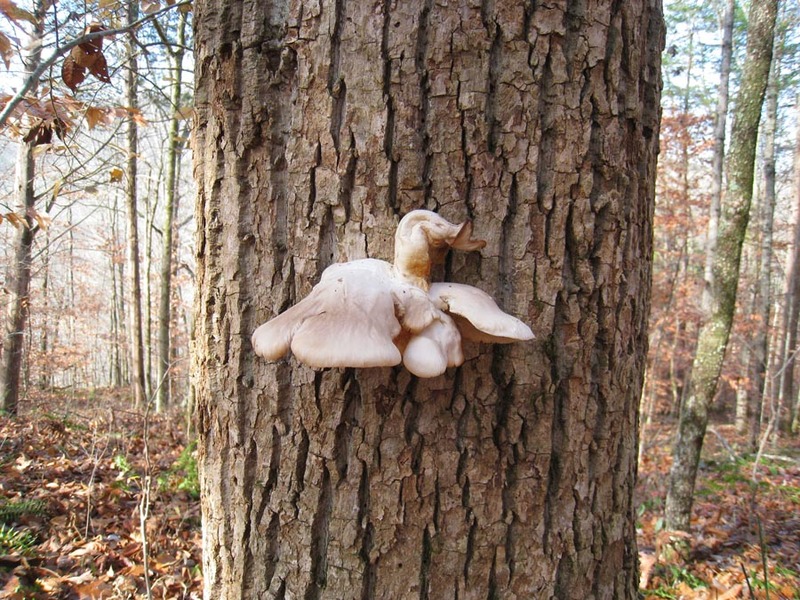 This one showed a hiker instead of a horse. Ah! The Real Hiking Parking Area. Not an Exausting Hike But It Is Fair To Call It Strenous. 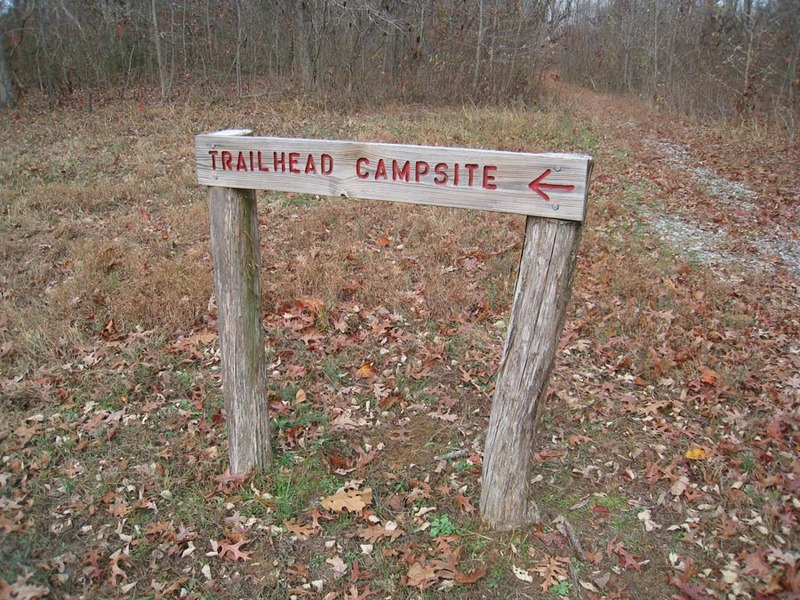 The trails, trailhead parking and camping areas are extremely well maintained with good signage. They even have porta-potties at the parking lots. Certainly the lap of luxury. 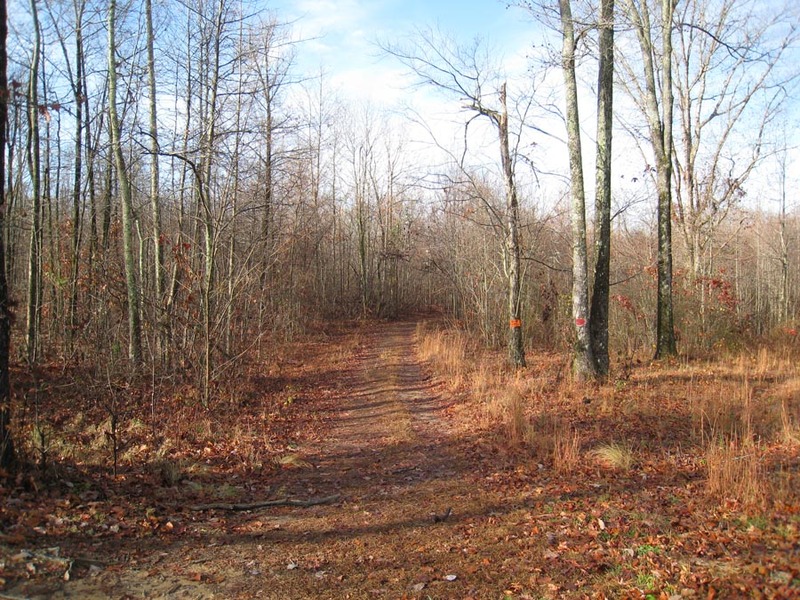 The trail starts off very flat with easily identifiable red blazes (not the yellow blazes of the horse trail). Fairly quickly you begin your descent. After two miles and many switchbacks you reach Hurricane Creek which you cross on a log footbridge. Solid and fun. Nice Wide Flat Trail At The Start. Narrows Quickly But Still Mostly Flat. Trail Quickly Begins To Descend. First Sign Of Water. A Small Trickle. 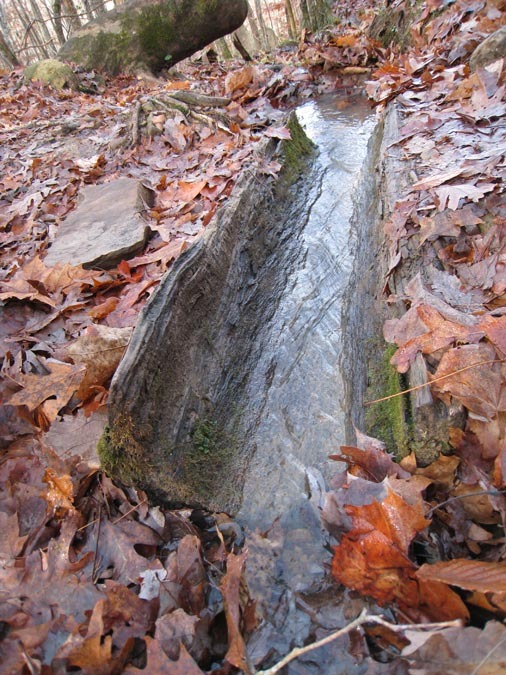 Half A Hollow Log. Nature's Rain Gutter. First Glimpse Of Hurricane Creek. 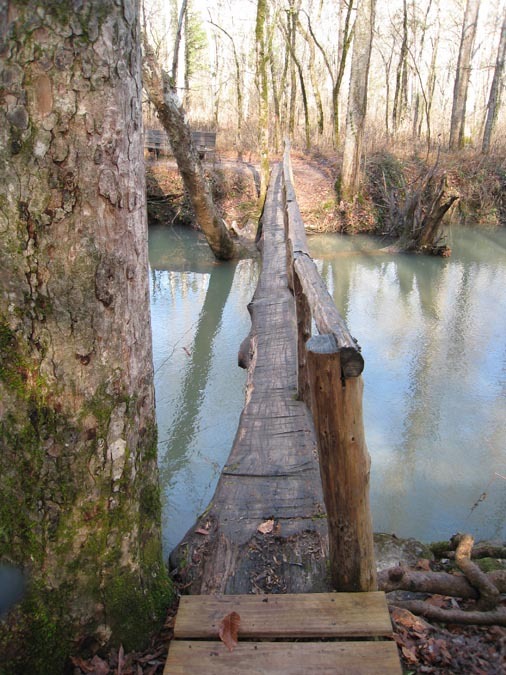 The Footbridge Is A Log! Cool! Somewhere along the way you will have passed a larger than average sinkhole on the right side of the trail (unverified GPS location 34.978626, -86.088583). When we were hiking, there were three people that went in the cave at the bottom of this sinkhole. They caught up to us later at the Walls and showed us pictures they had taken inside. I was a little surprised at how extensive it was. It would be a cool but muddy side trip to consider for a future hike. It didn’t appear that they needed any spelunking equipment to enjoy it. 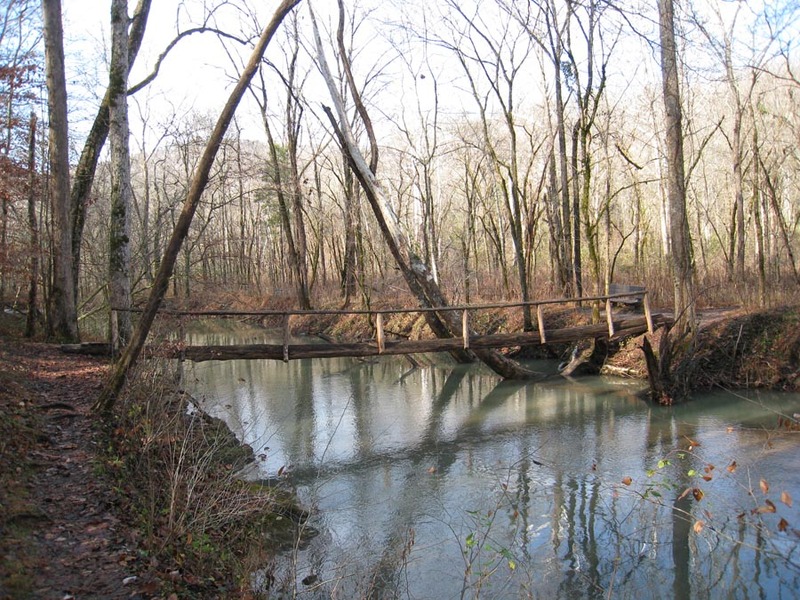 Once across Hurricane Creek, the trail levels out for a while in a much more open setting (no big trees towering over you) and you come to another log bridge but this time it is over Turkey Creek. You’ll be following Turkey Creek all the way to the Walls now. 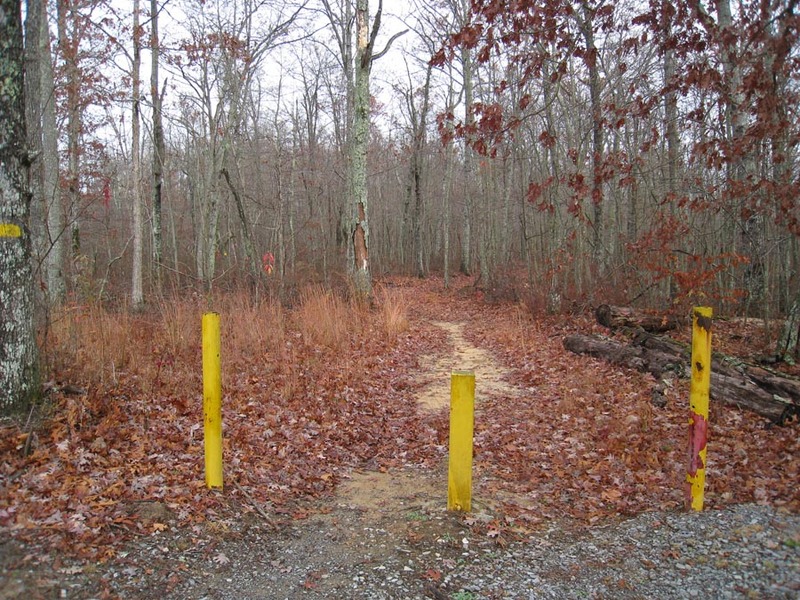 Trail Flattens Out and Opens Up. 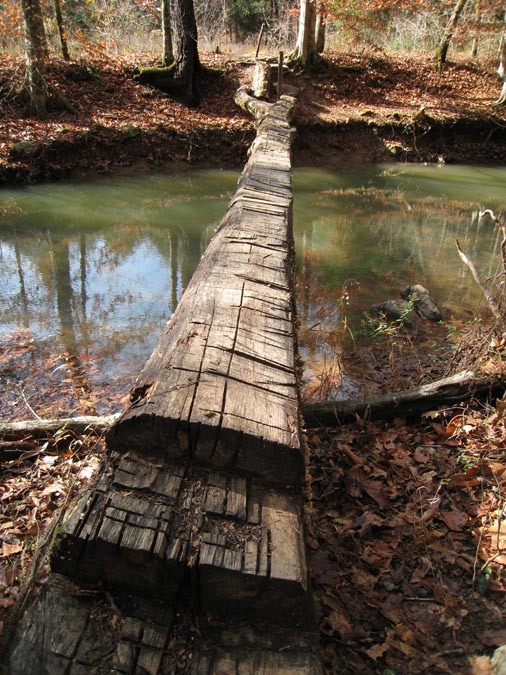 Log Bridge Across Turkey Creek. 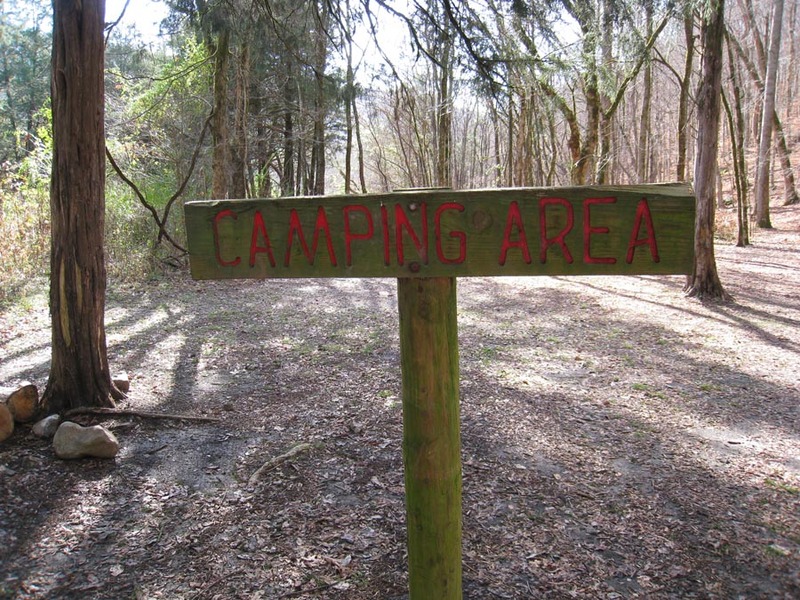 Just after you cross Turkey Creek (at about 2.5 miles) you will come to a large and well maintained campsite. 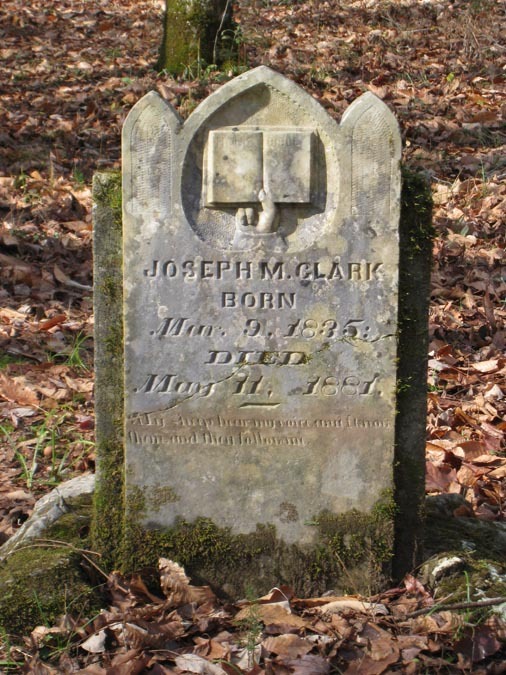 Just on the edge of the campsite is a graveyard called Clark Cemetery. 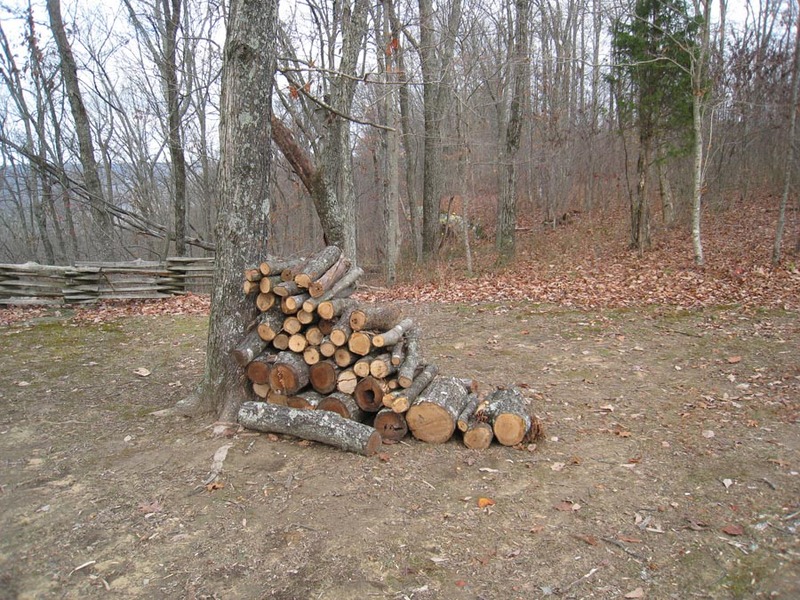 This would probably be a great place for ghost stories around the campfire. Nice Large Flat Well-Maintained Campsite. 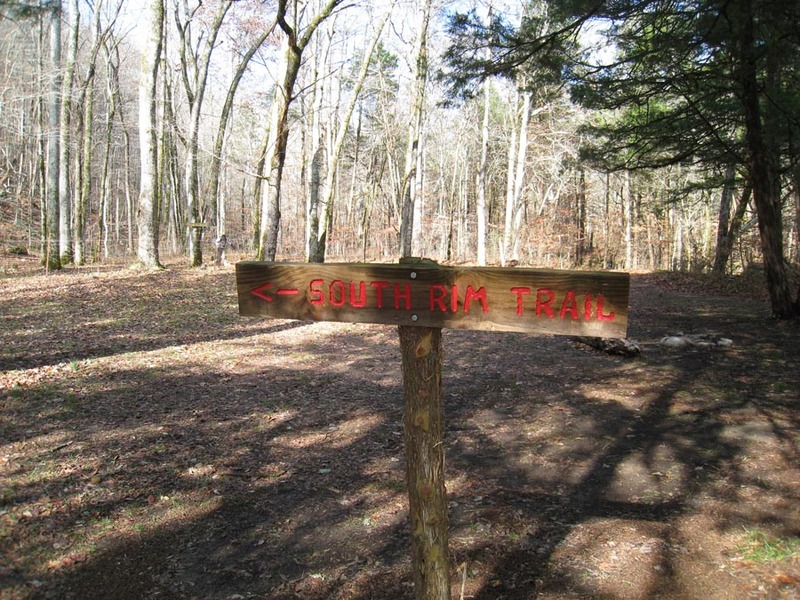 At the campground you could take a left and follow the South Rim Trail which, not surprisingly, would have you climb out of the gorge and follow the Walls along its southern rim. 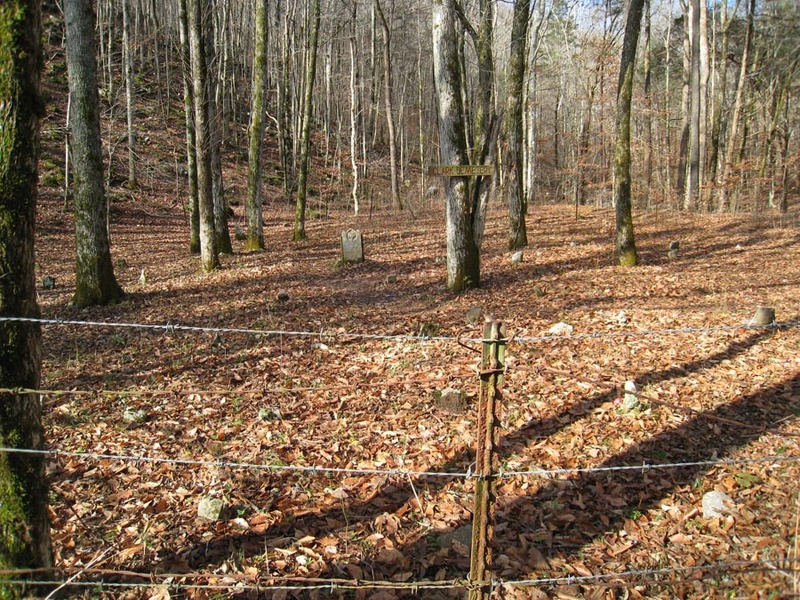 We chose stay straight on the main trail that passes the graveyard and continues into the gorge. 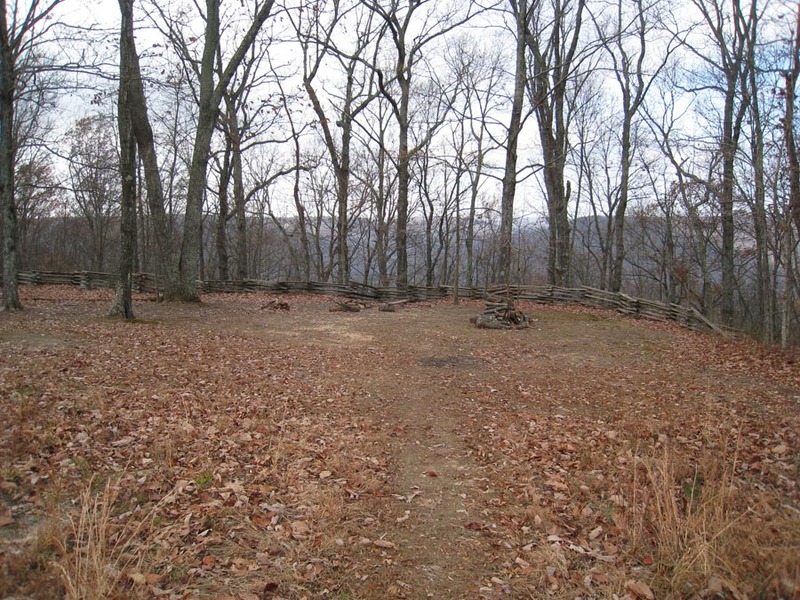 You Can Branch Off For The South Rim Trail At The Campsite. 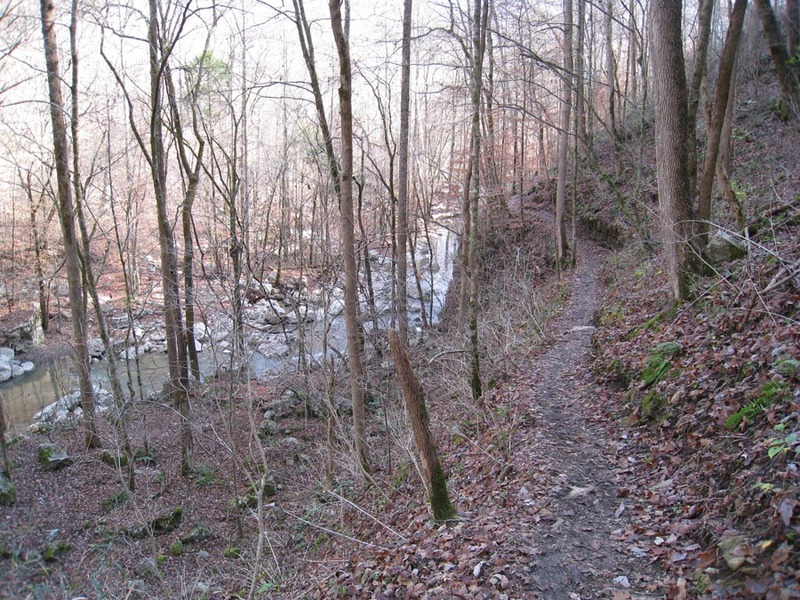 Staying on the main trail, you’ll follow Turkey Creek along and up the hillside that opposes the one you just descended. 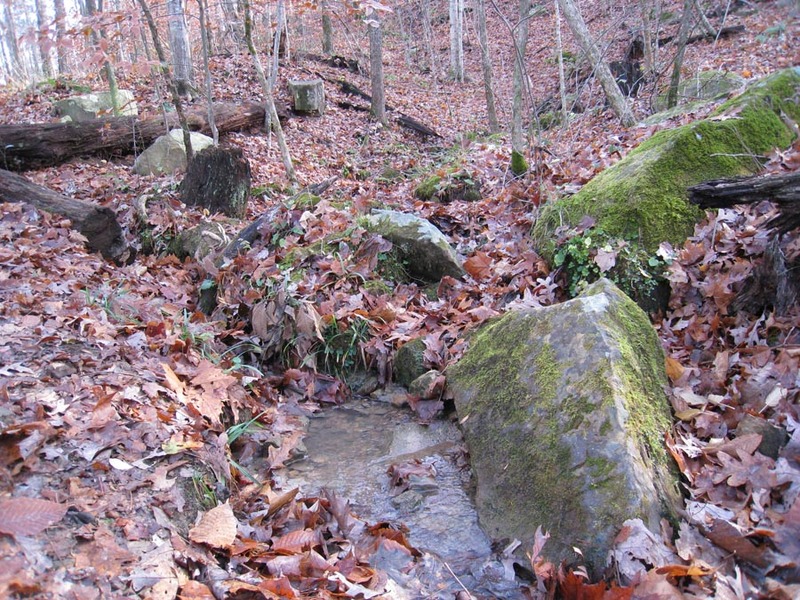 When we were there it was just a dry creek bed for a good while. Counter-intuitively, this is where the muddy stuff really starts and there are more loose fist-sized rocks to deal with. It is nothing treacherous but footing can be tricky and your pace will slow. Trail Begins Its Up And Down Ramble. Here Come Da Mud. Steep Downhill Slip N' Slide. Turkey Creek Isn't Dry Anymore. First Cascades. We Must Be Getting Close. The Creek Has Really Widened. 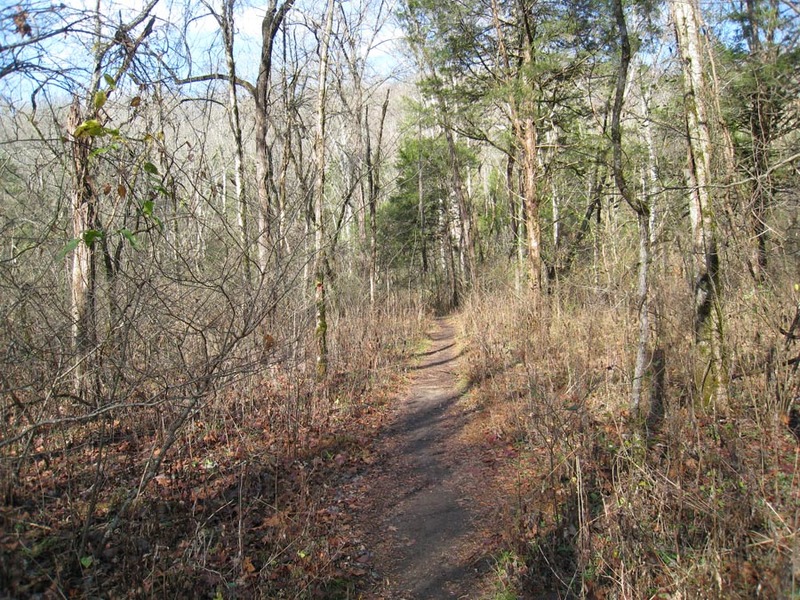 Near the end of the trail (about another half mile) you will cross Turkey Creek. By this point for us, it was a nice-sized slow-moving stream that required getting wet to cross. It was fun but the rocks growing algae were slick as ice. Immediately on the other side you’ll summit a little hill where you have a nice view of a big pool with water cascading into it. Water Cascades Into Big Pool. View From Top Of Cascade. Just around the corner you will enter the amphitheater. 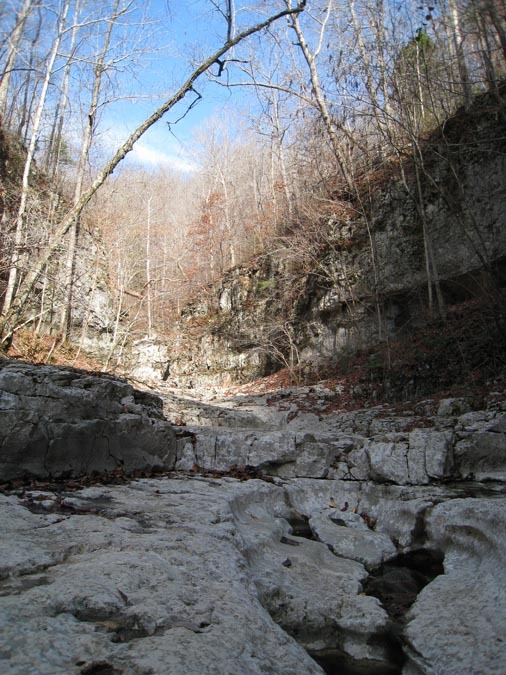 To your left will be a large cascade of water issuing out of a big hole in the side of the gorge. You can scramble around and get right up to the opening, but be warned, it is super slick around here. We saw another hiker fall hard here. Melanie slipped and did a 270 around one of her poles (pretty spectacular to see) but stayed upright. I wasn’t so lucky and did James Brown-worthy split landing on my knee and thigh. Fortunately it was slowed down by my trekking poles and it didn’t really hurt at all. 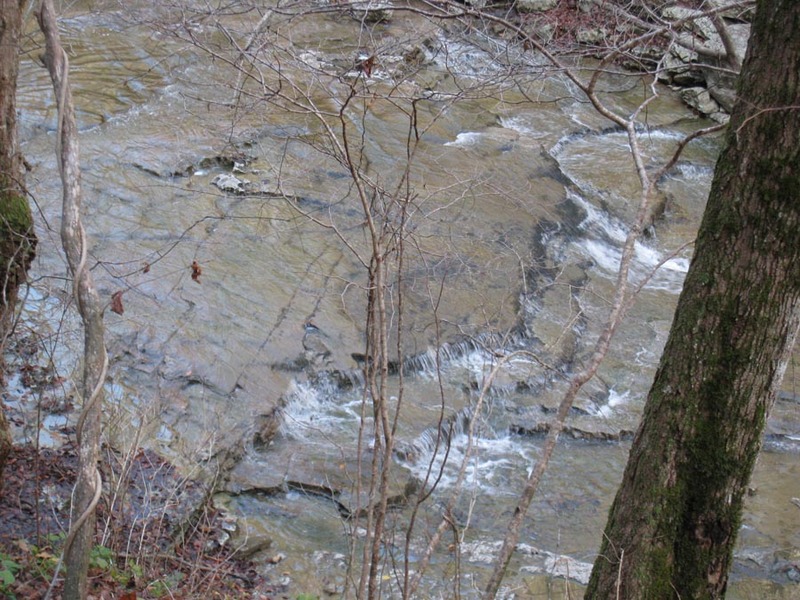 Cascade at Walls of Jericho. 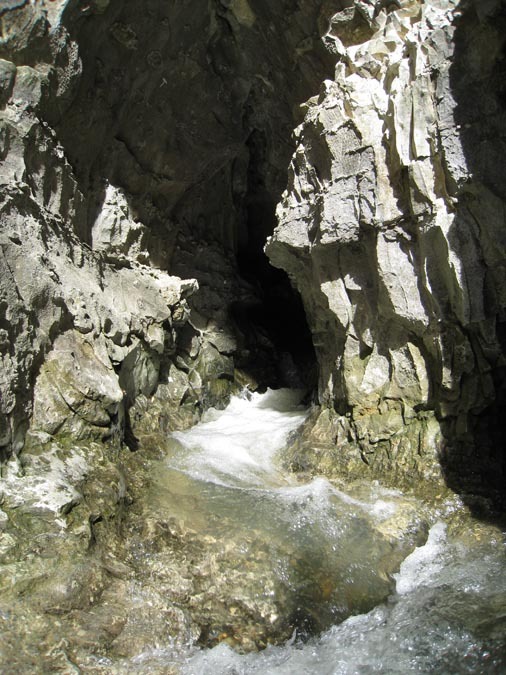 Water Pours Out Of Rock Walls In Multiple Swiss Cheese Holes. 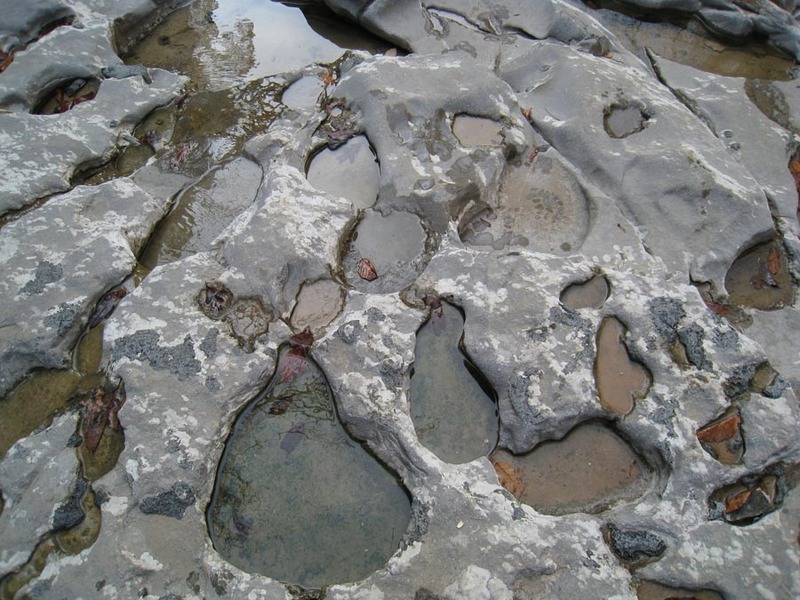 More Examples Of Water Holes. Big Hole That Feeds The Main Cascades. The Rocks Look Galvanized. Neat! 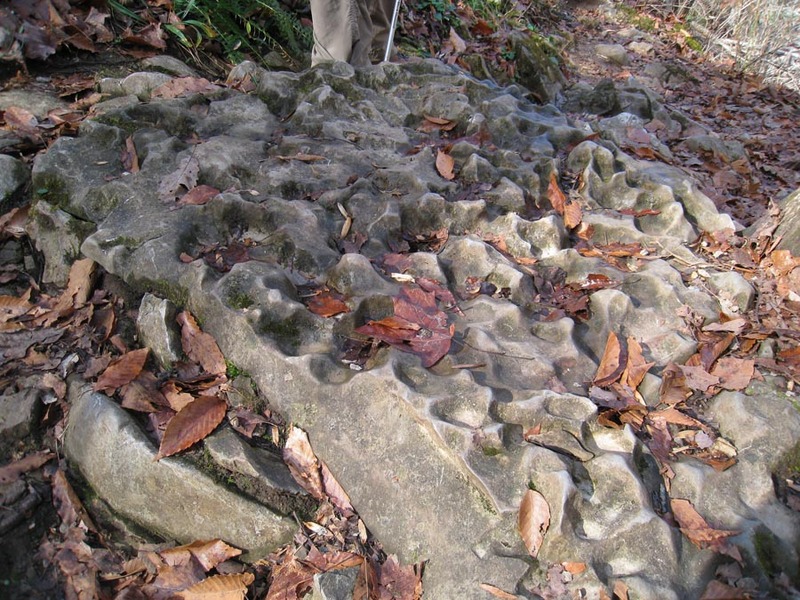 Eroded Rocks At Walls Of Jericho. While Melanie sat in the sun and ate lunch. I dumped my gear and climbed the back wall of the amphitheater to see what lay beyond. 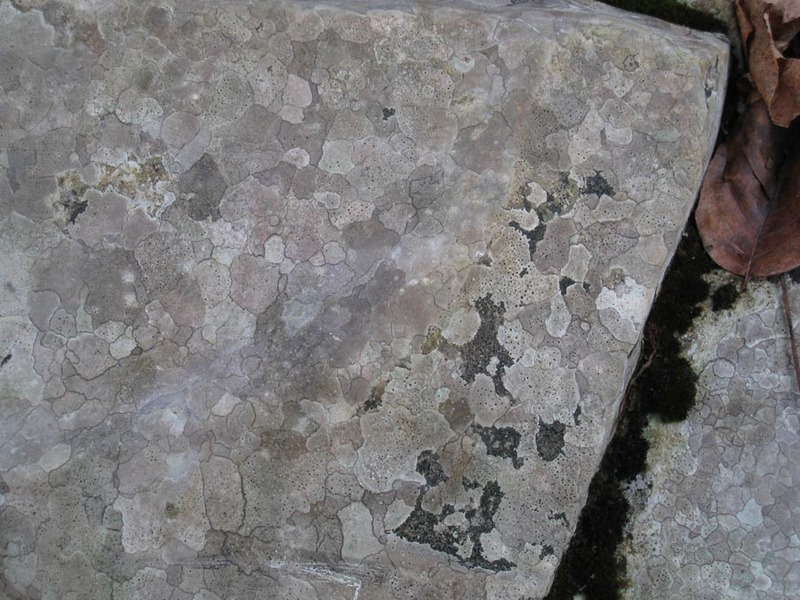 There was another flat stone area with a raised back wall. I climbed that wall and beyond that was another flat area with another raised wall. Climb Up the Back Wall of Jericho And You See This. At The Top Of The Second Rock Wall. At this point the caving hikers caught up with me and explained that this series of “steps” continued up to a dead end in the gorge and apparently there was a fairly difficult-to-find trail that lead back to the parking area from there. They didn’t know exactly where it was and weren’t planning to go that far. I turned around since it didn’t seem like there would be much to see that way and there was no way that Melanie was going to be able to climb up there without my help anyway because the first wall was so tall. The hike to the Walls is pretty simple and easy. 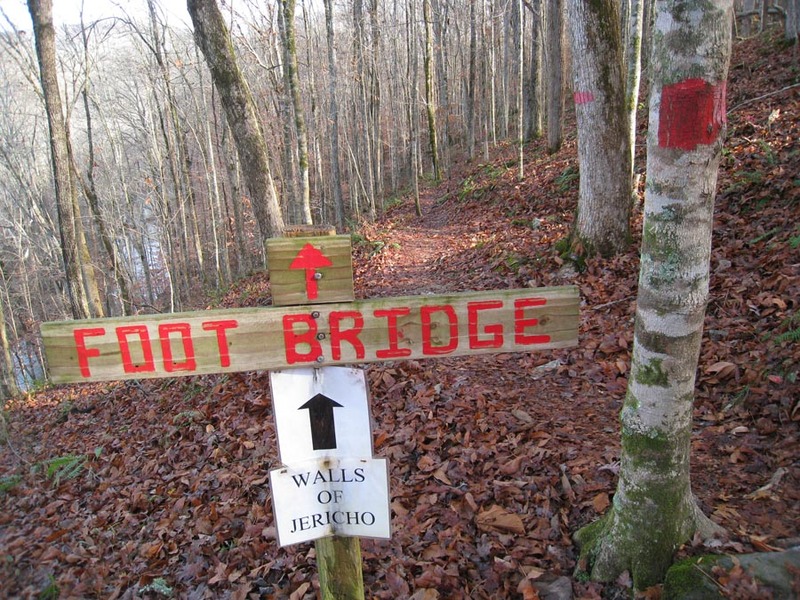 You have to watch your footing for the last half mile, as noted above, but other than that it is a downhill walk. Of course that means the return trip is mostly an uphill climb. If you exercise regularly, it probably won’t be a big deal. If you don’t, just plan to stop and catch your breath every now and then. I think most adults could complete this hike and still be happy at the end. 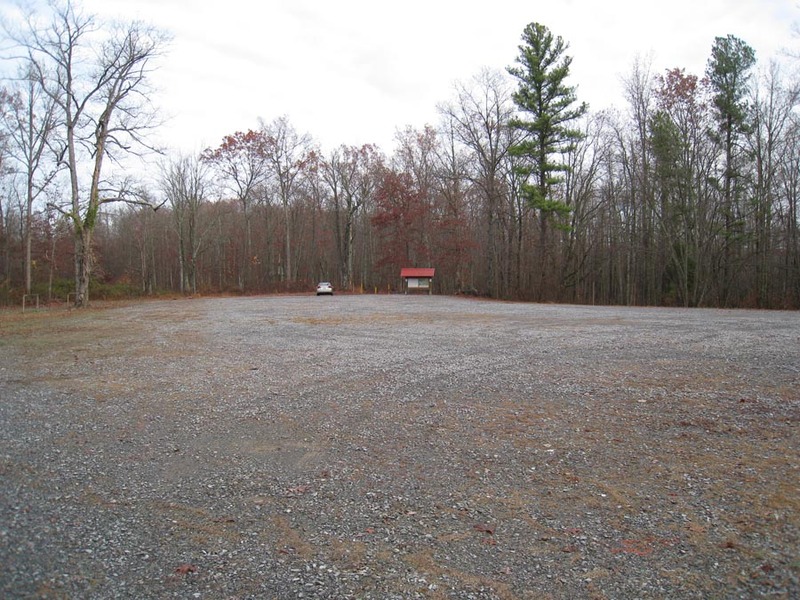 Back at the car, I decided to check out a primitive camping area within a couple hundred yards of the parking lot. Just like the other one, this one is nice and clean. It has a decent view of the valley and is within walking distance of the parking lot porta-potty. Campsite At Parking Lot Is Just A Little Down This Horse Trail. 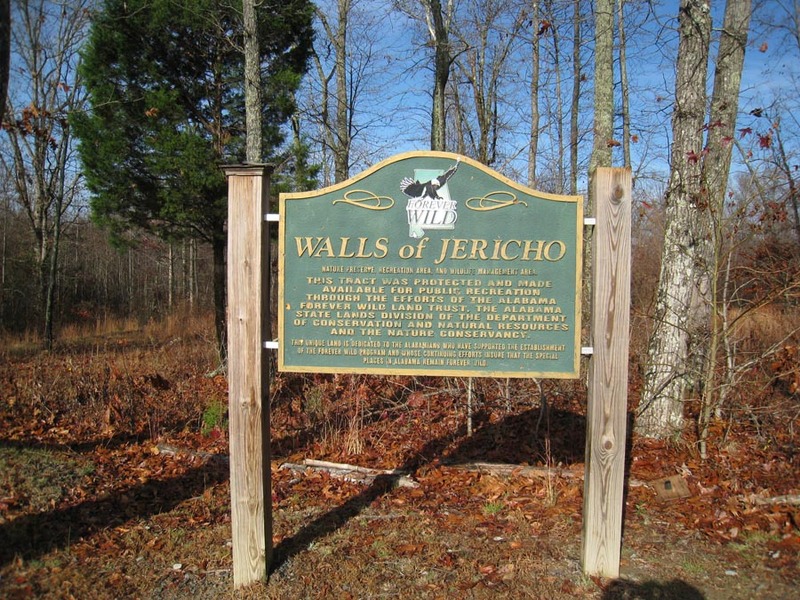 If you are within driving distance of the Walls of Jericho it is a worthwhile hike. You don’t have to dedicate an entire day to it so you can take your time or start later in the morning. 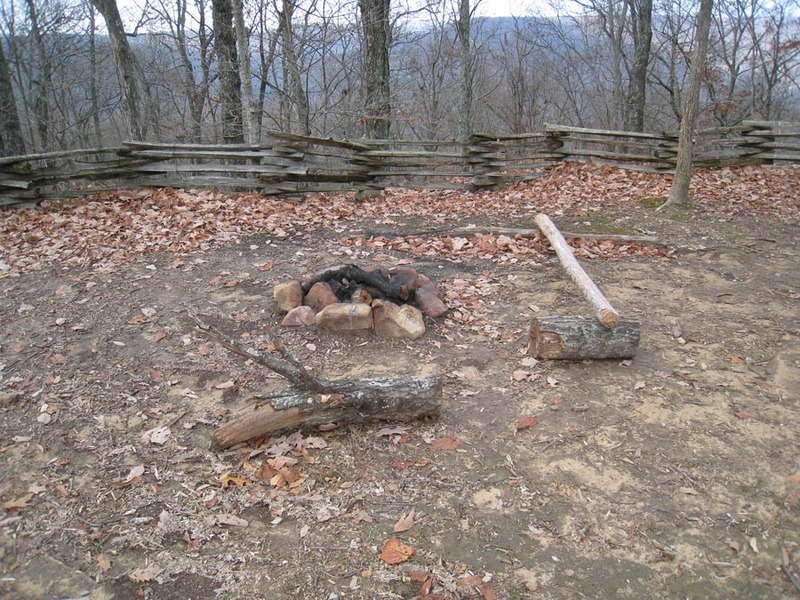 There are other things to do in the area (I’m interested in finding out more about the Bear Den Point Trail). You could even break it up into a two day affair if you like to camp or backpack, which would be great for younger hikers. It isn’t the greatest natural wonder I’ve ever seen but I’m certainly glad that I got to visit. 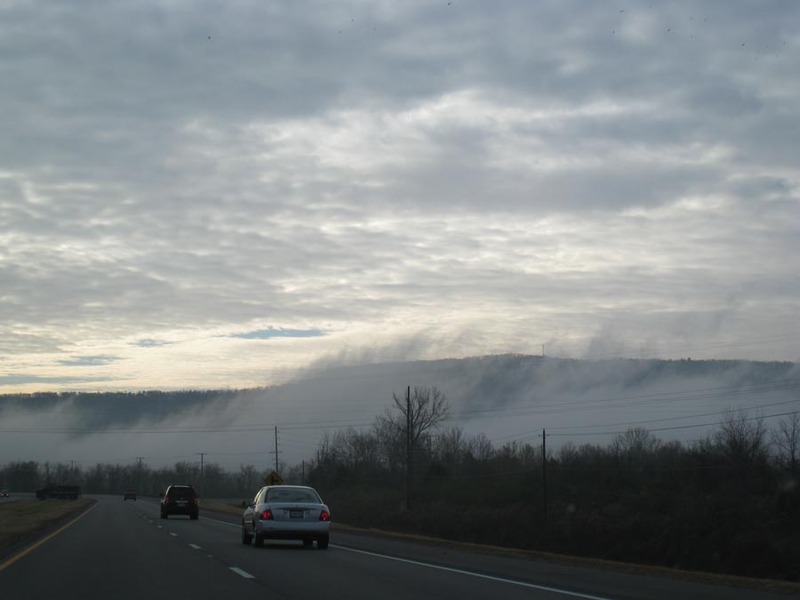 Location: Near Scottsboro, AL (Just north of Hytop) on Highway 79. Google Maps has a surprisingly accurate push pin location for it if you enter “Walls of Jericho, Estillfork, Jackson, Alabama 35745” (see image below). Green Arrow Marks Trailhead. Red "A" Marks Approximate Walls of Jericho Location. 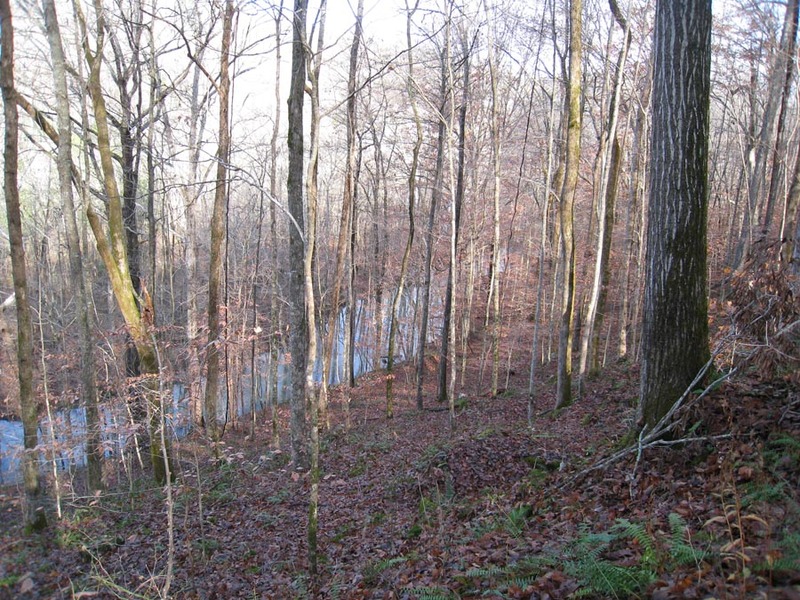 Photos Between The Two Approximates The Trail Location. 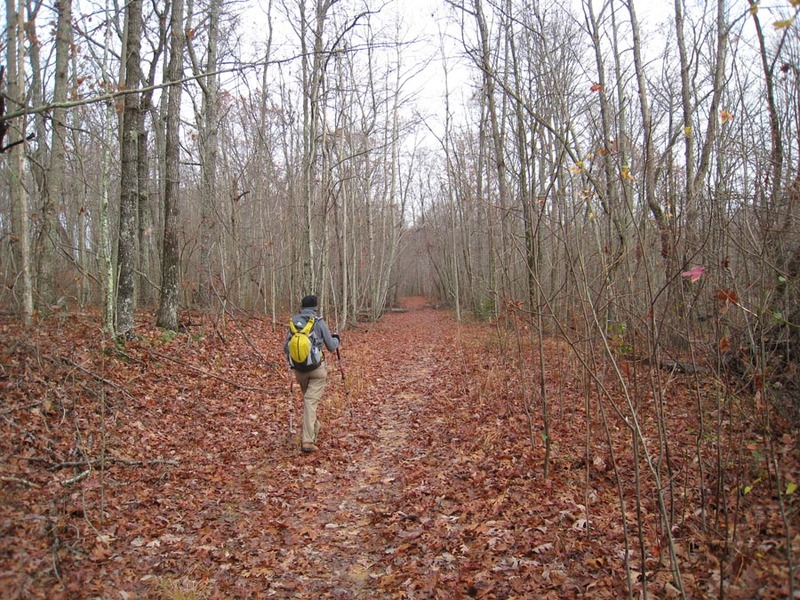 Notes: Trail is muddy and slippery in parts. Recommend a partner and trekking poles. Requires a shallow stream crossing. Recommend waterproof boots and/or change of socks and shoes. 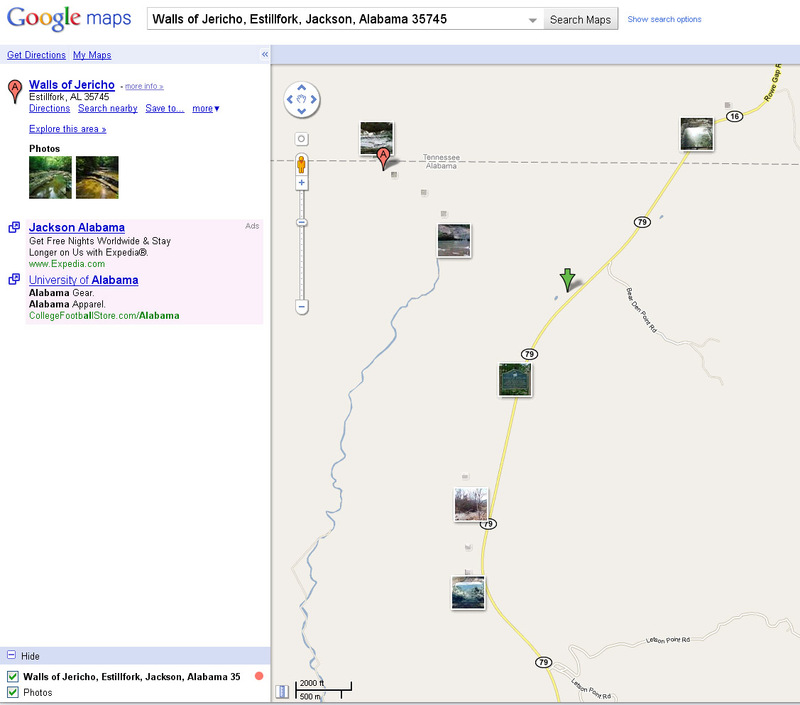 Maps: Map tagged with GPS coordinates and photos. For my birthday this year Melanie and I wanted to do something more special. I was tasked with coming up with a plan even better than dinner out and a cupcake with a candle. We settled on two short trips. One would be to Islands of Adventure down in Orlando (the best theme park we’ve ever been to) because they’ve opened a new Harry Potter section. The second would be to Huntsville to see the science and Star Wars display at the Rocket Center. I’m not always the quickest, but sometime later I realized that we would have several additional days free in Melanie’s work schedule as a result of all this travel. We couldn’t just waste that precious time. It occurred to me that the weather should be getting nice for hiking and we might just catch some leaves changing color. The very best fall leaves we’ve ever seen was on a trip to South Carolina’s high point several years ago. The rainfall that year, the temperature change and the clear sunny day all worked together to make something almost painfully beautiful. I think of Bob Ross paintings as super saturated but I don’t think even he could have captured the brilliant colors we saw. 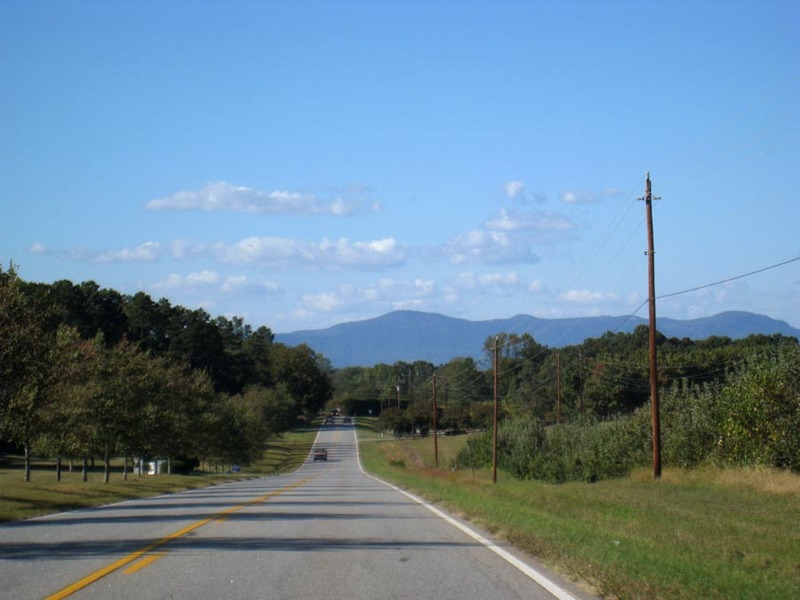 As we would ride up the steep slopes of the foothills we’d see electric blue skies and then be suddenly plunged into windshield-filling riots of oranges, yellows and reds as we crested then descended. Literally windshield filling. Road. 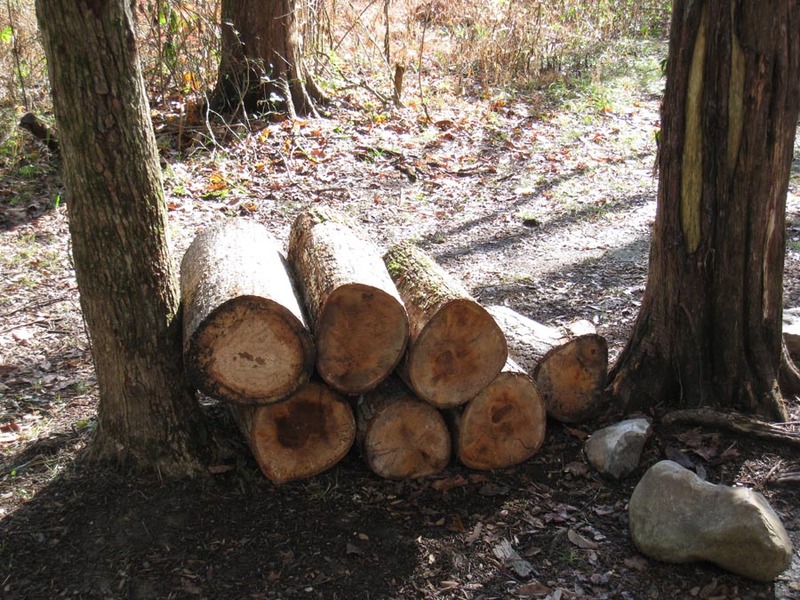 Some tree trunks. LOTS of leaves. It could be so overwhelming that your brain couldn’t process what you were looking at immediately. I guess it was more than a little bit like camouflage. The normal shapes of things were broken up flattening the landscape into one mash of color. Like a roller coaster ride, it did take my breath away more than once. Jump forward to mid October of this year and Melanie and I are hoping for a repeat performance. Heck, even a quiet echo of that previous trip would be great. A quick internet search for fall foliage cross referenced to Google Maps showed that our quickest, easiest best bet was South Carolina again. 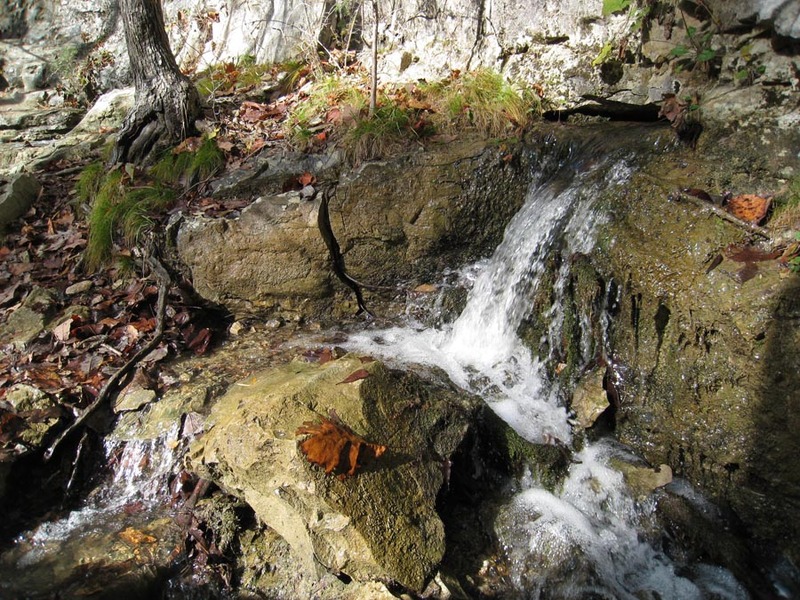 The online guides recommended Caesar’s Head State Park as a great place to see leaves, and what’s this, they have waterfalls too! Bright idea #2. Even if we don’t see cool leaves we can see some cool waterfalls. Our trip to Virgin Falls last year taught me that some of the falls in this general area are flowing nicely at this time of year. We couldn’t lose now. Unfortunately, Casear’s Head doesn’t have any drive-up camping. I knew that we were going to want to camp to save money. I also knew that we were not going to want to backpack and if at all possible we were going to want a hot shower. I know, I’m a baby. Technology is creeping in to the various park systems. In SC you can now not only check out the different services offered but actually view a map of every individual campsite with details about it including if it is reserved and for which days. This made it easy to find a state park close by that met our needs. We chose Table Rock State Park and it was great. It is a very well-maintained park. Nice and clean. 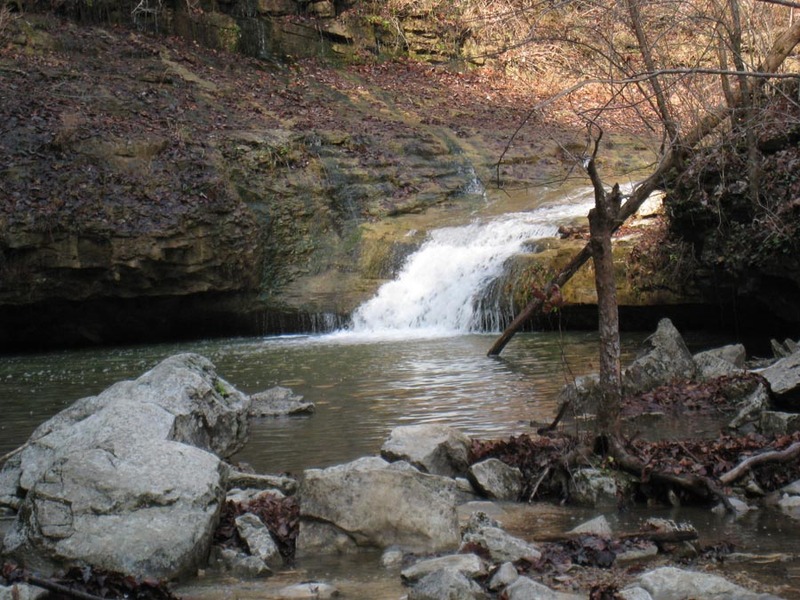 It’s a great setting with a small lake and a big ol’ rock outcropping (Table Rock). They have hike-in camping (some on the lake looked really nice), drive-up camping, RV stations and cabins (which we didn’t see). We stayed in the area designated “Loop B” for $45.73 for two nights. 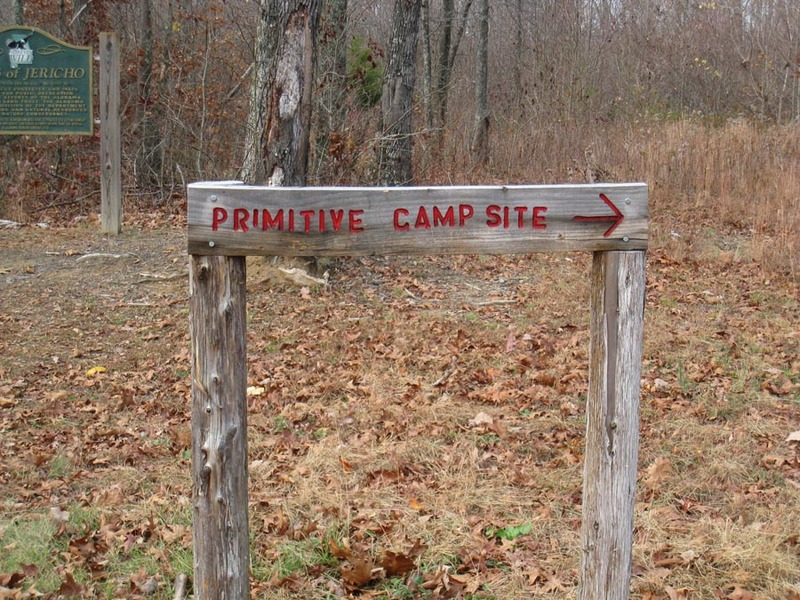 It was set up with both primitive and RV spots. It had a few bathhouses sprinkled throughout the area. They had been remodeled sometime very recently with fresh paint and new tile. There was no mold or stink. Everything was very clean. The showers bordered on too hot. Plenty of bear-proof trash cans in the camping area. Nice and shady. Overall, I’d say it is as nice as any other stop n’ drop campsite I’ve ever used. Please note: When reserving the individual sites you will be presented with slope information for some locations. If it says that it isn’t flat, that is something to consider. None are sheer cliff faces but if you are in a tent instead of a self-leveling RV, it is something to keep in mind if you don’t want all your blood rushing to your head or feet while you sleep. 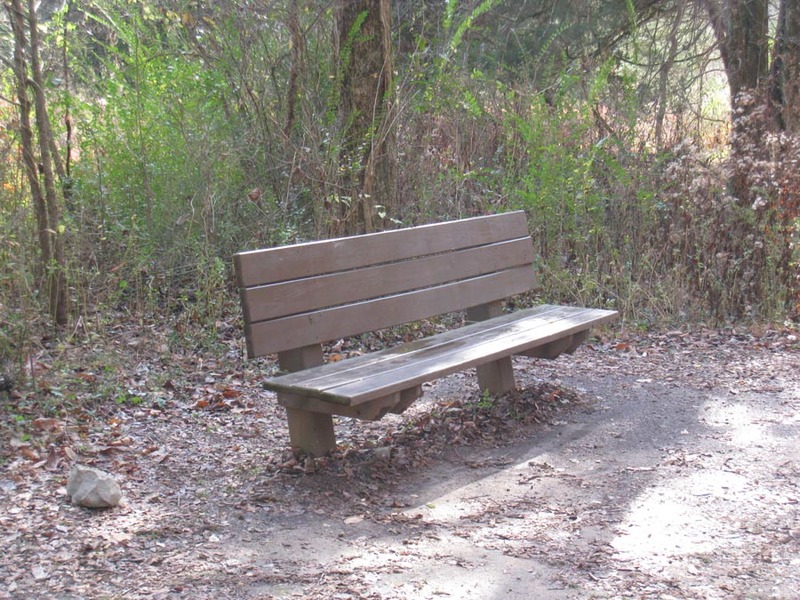 I wish I could tell you more about this park because it seems like a nice place to explore. There were many folks there just hanging out watching football and enjoying the setting. We were on a mission to see waterfalls though and this park just didn’t deliver in that area.